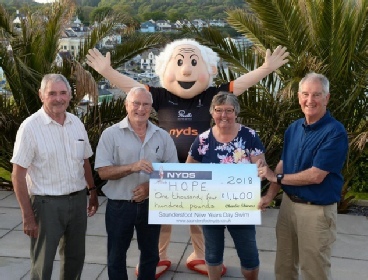 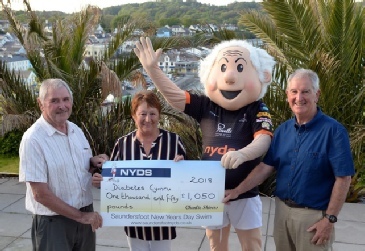 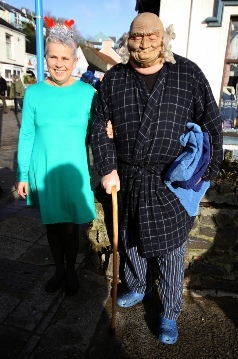 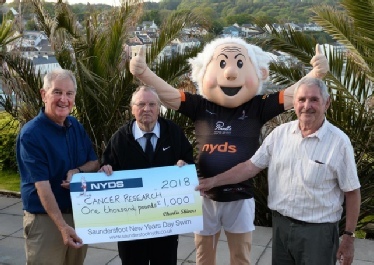 The Presentation Evening for the 2018 Saundersfoot New Year’s Day Swim was held at the St Brides Spa Hotel on the evening of May 17th. 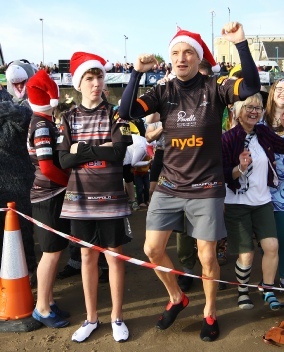 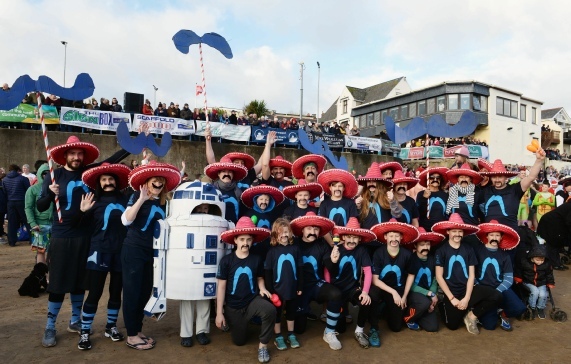 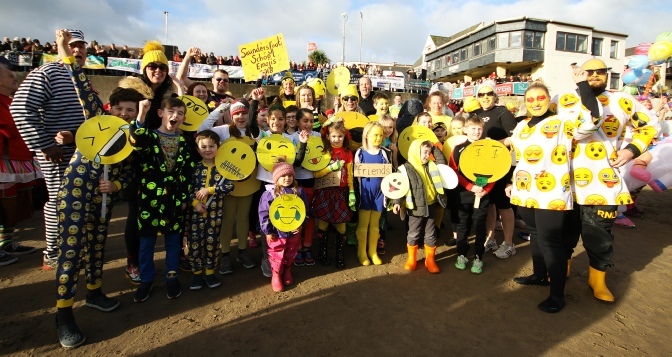 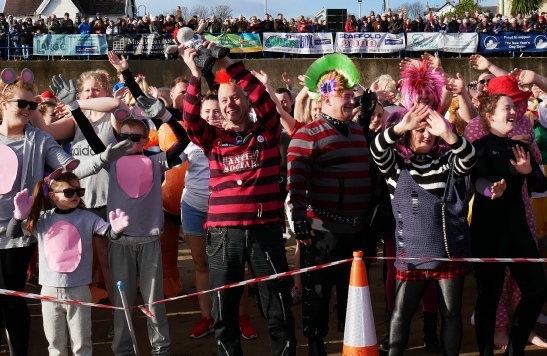 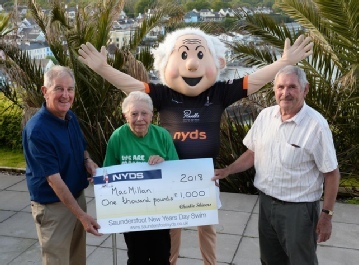 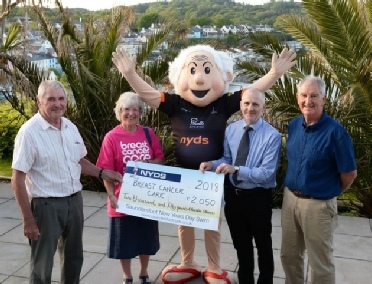 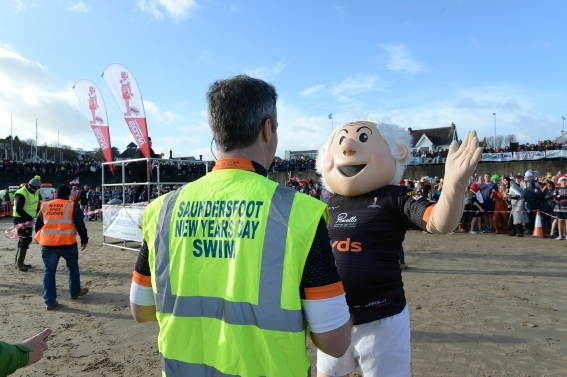 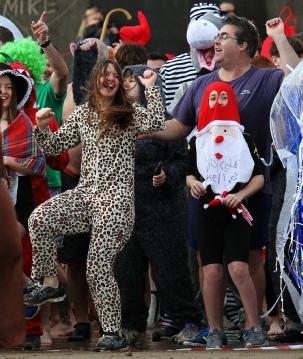 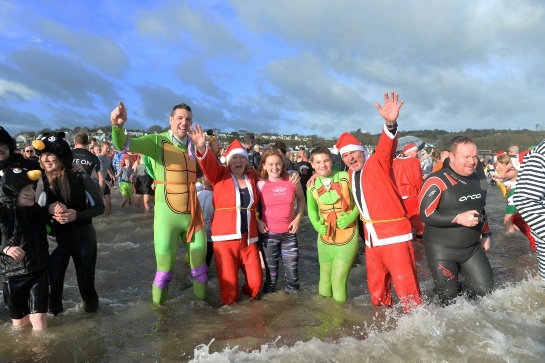 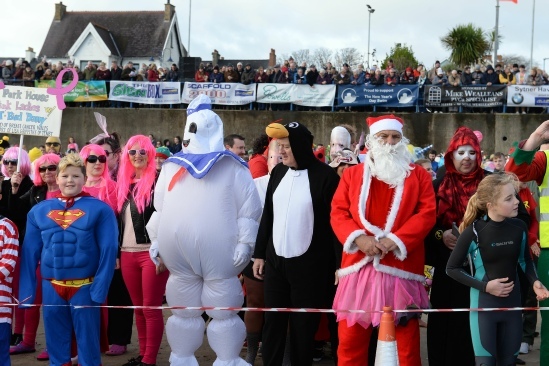 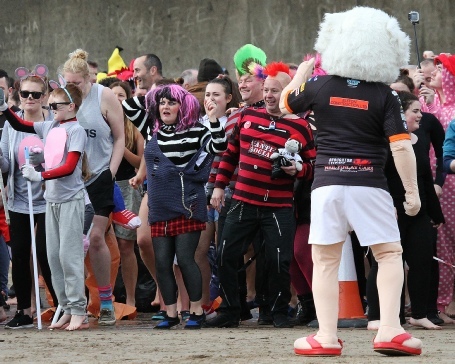 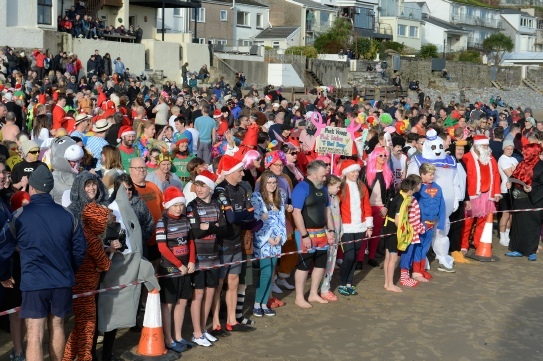 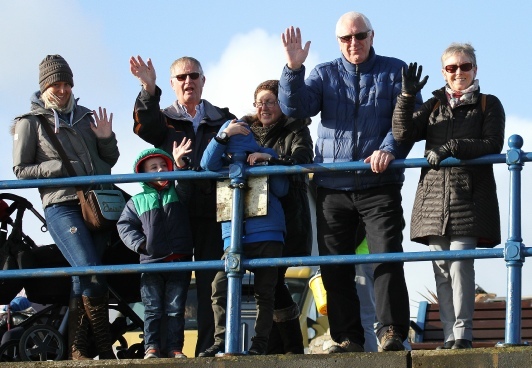 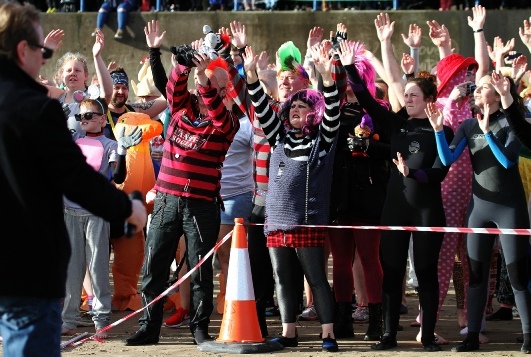 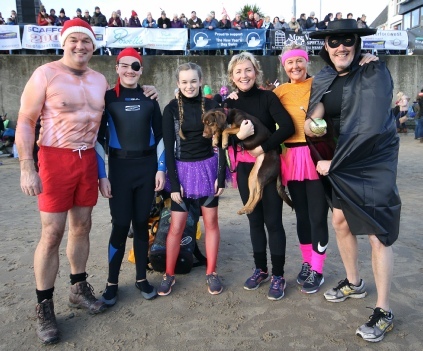 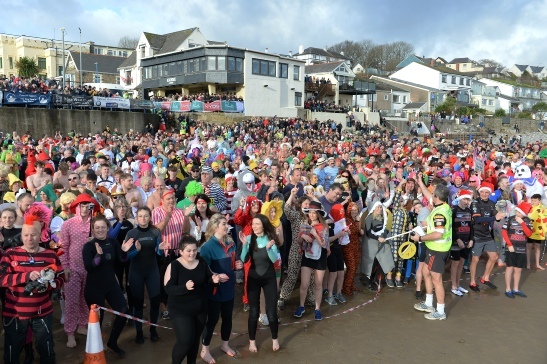 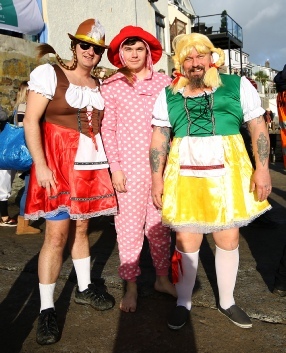 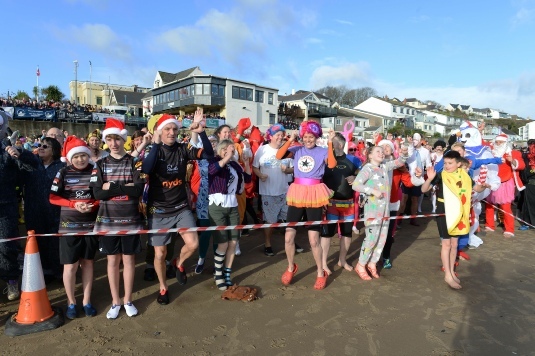 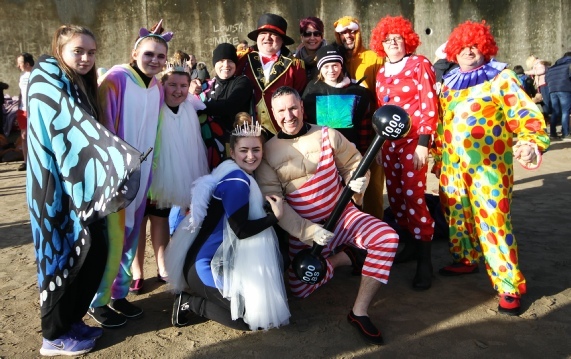 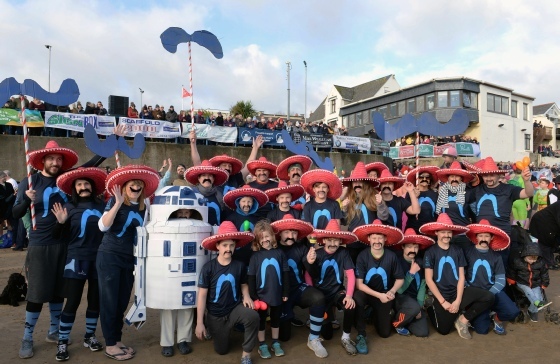 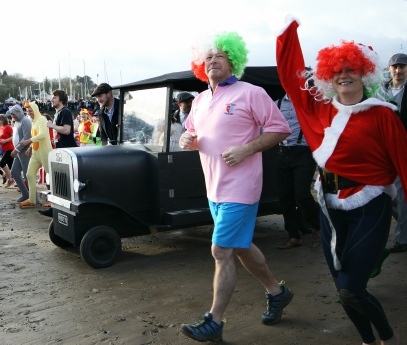 Saundersfoot Festivities thanked all swimmers, sponsors, commercial sponsors and helpers for contributing to the magnificent £43,736 raised by the Swim. 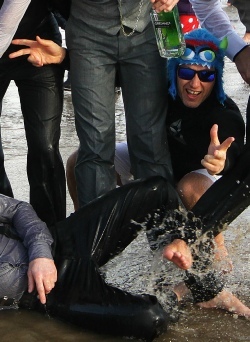 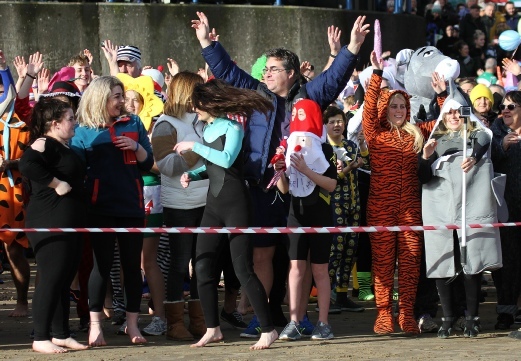 The money raised by the swimmers benefited 53 charitable and worthy causes. 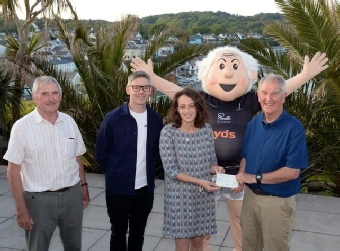 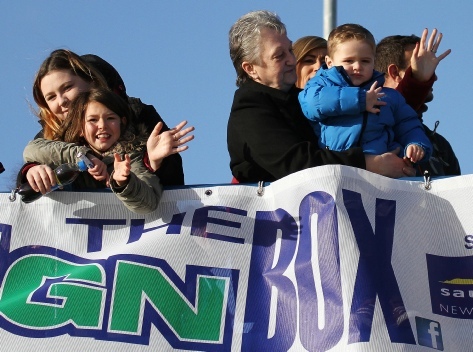 The generosity of the commercial sponsors ensured that every penny raised was donated to charity. 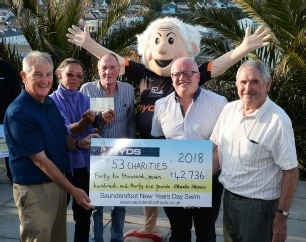 Among the recipients were a number of charities that received at least £1000. 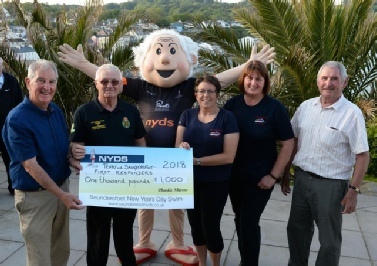 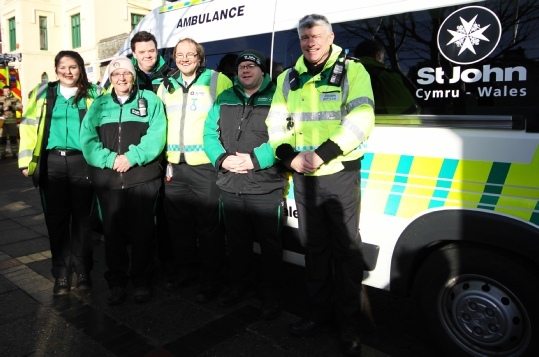 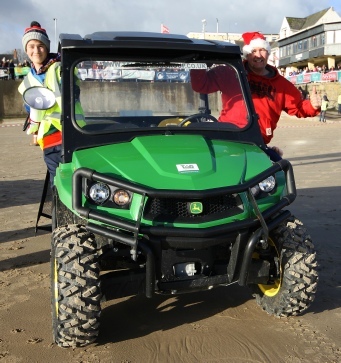 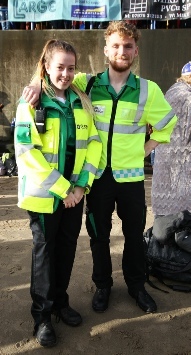 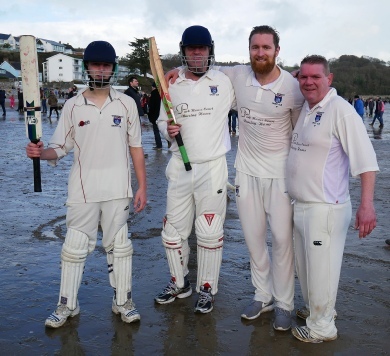 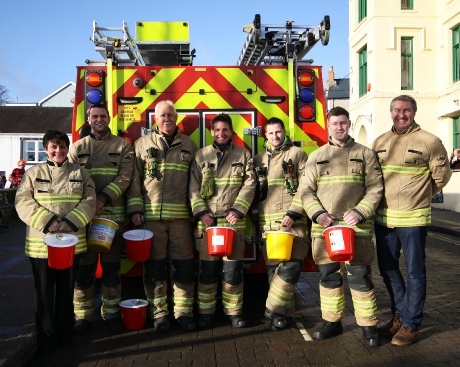 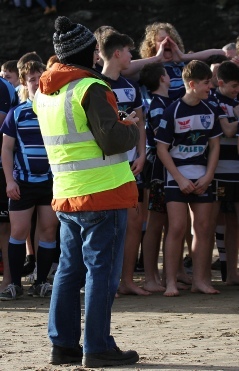 They included the Tenby & Saundersfoot First Responders, HOPE, MacMillan, Cancer Research, Diabetes Cymru, Paul Sartori, Kilgetty Cricket Club Juniors, Saundersfoot Footlights, Breast Cancer Care and Ovarian Cancer. 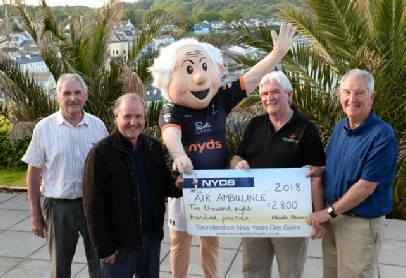 The highest cheque of £2,800 was presented to Wales Air Ambulance. 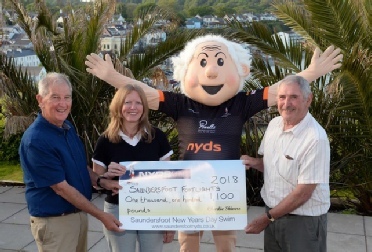 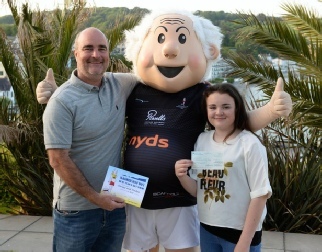 Main guests at the Presentation were Nicky Hurst of Powell’s Cottage Holidays (NYDS main sponsor), County Councillor Phil Baker and Phil Odley Jr, Chairman of the Saundersfoot Chamber of Tourism. 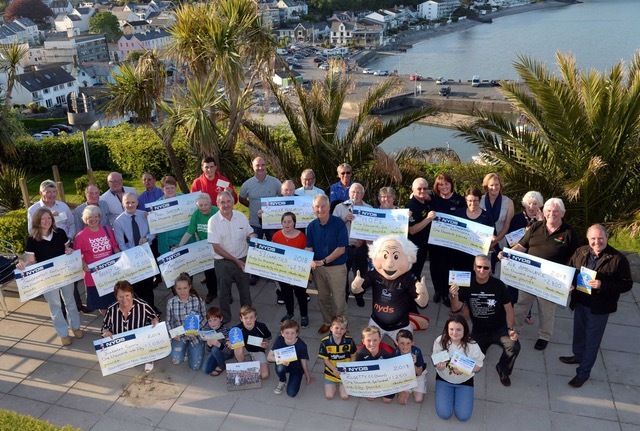 The guests helped to present the numerous certificates, awards and cheques. 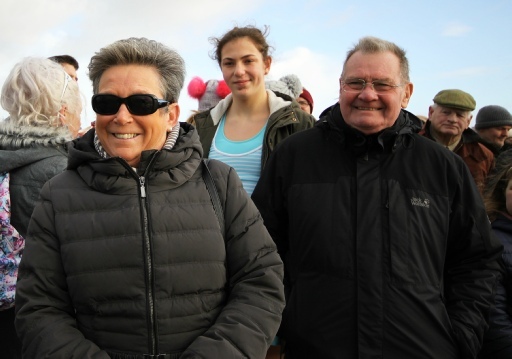 Winner of the Betty Duncan Cup for the highest sponsored swimmer was Sarah Hitchen who raised a fantastic £1,485 for Wales Air Ambulance. 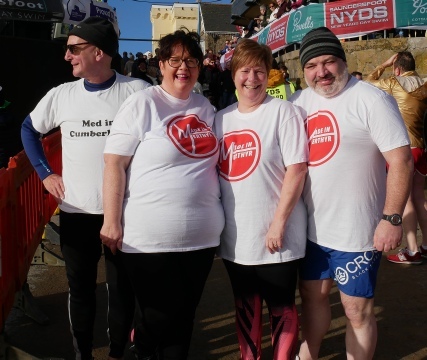 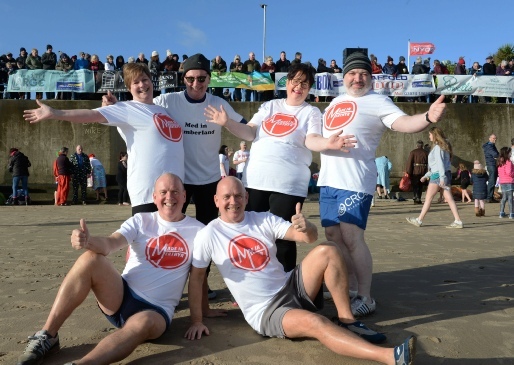 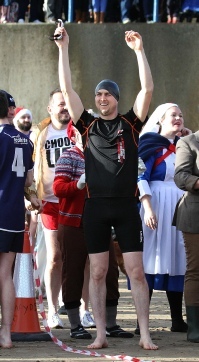 Four other swimmers raised in excess of £1000 each. 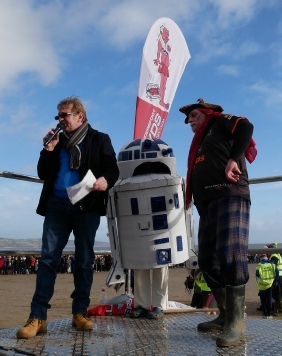 Following the throw of a dice, Brian Twose won a flight over the Gower with former Wales Rugby International, Ian Gough. 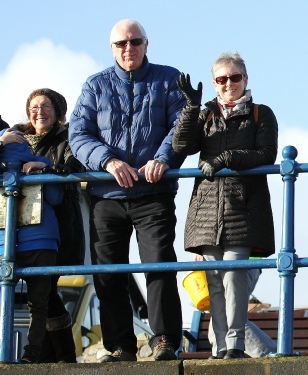 The prize was kindly arranged by Stephen Cole. 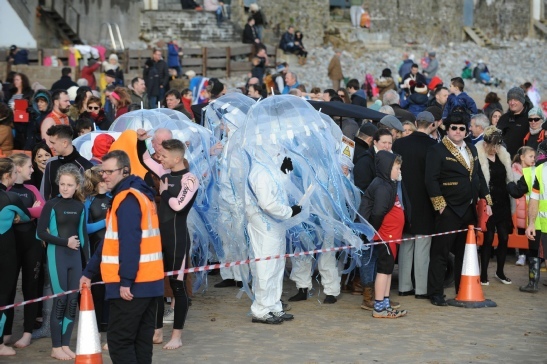 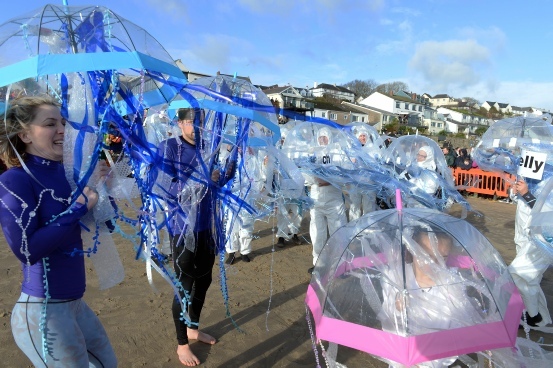 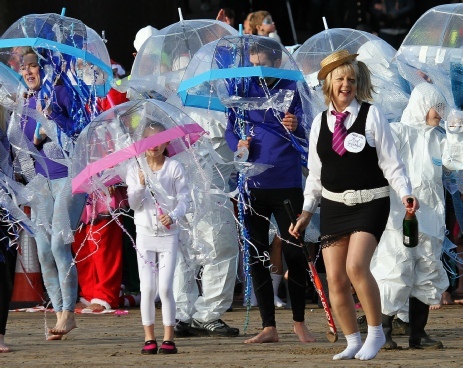 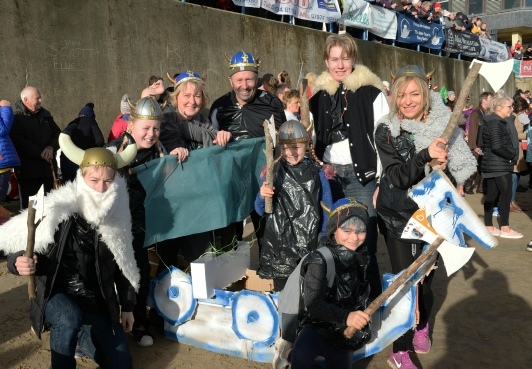 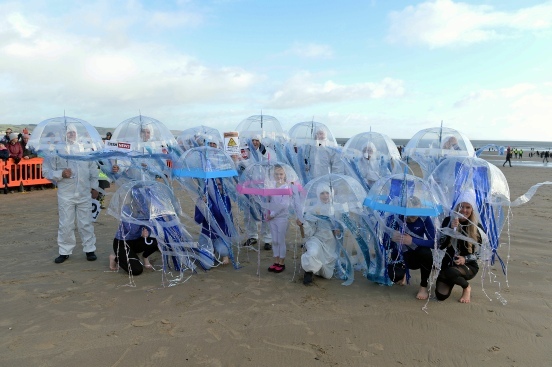 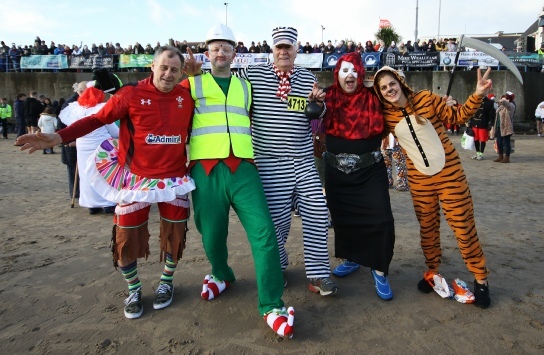 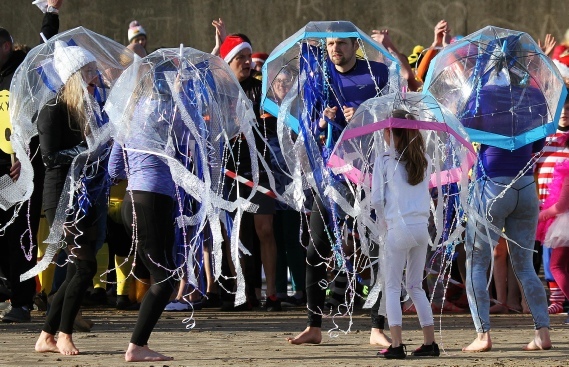 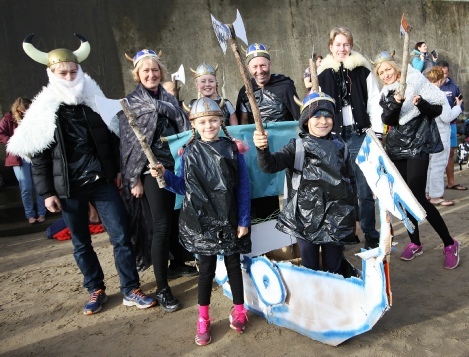 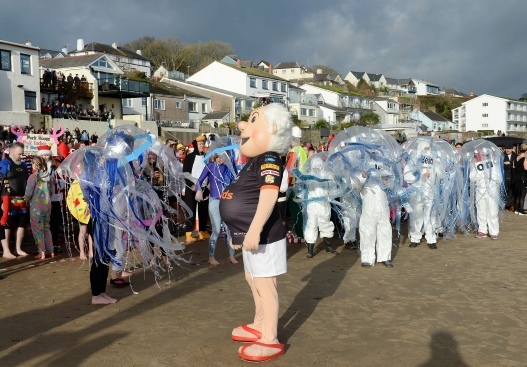 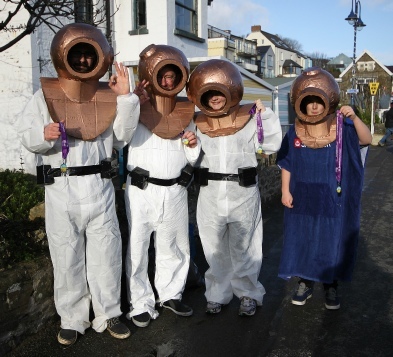 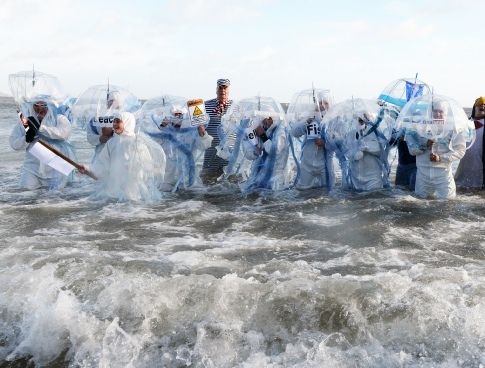 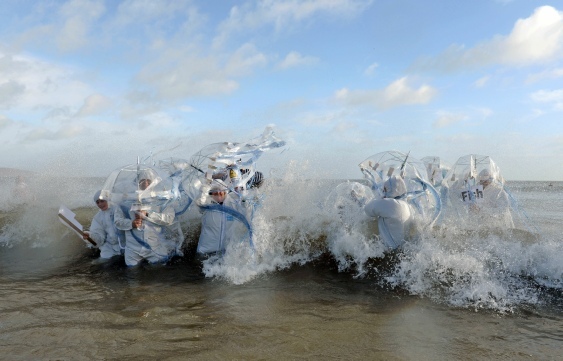 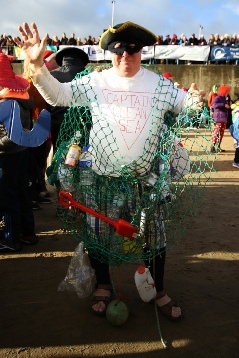 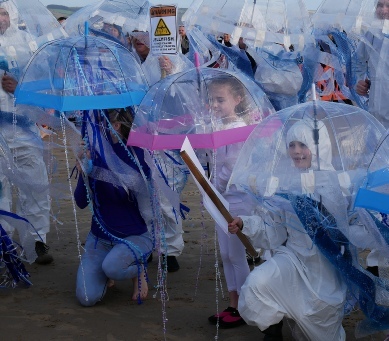 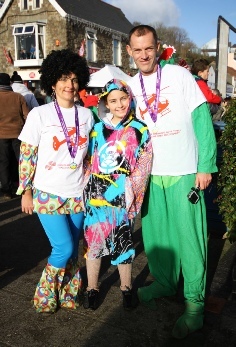 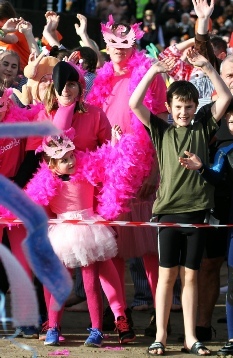 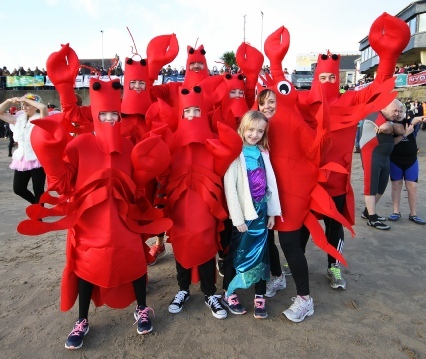 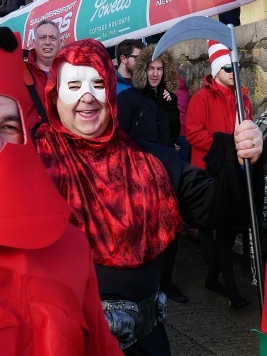 Best group fancy dress winners were Stepaside Coachworks for their sensational shoal of jellyfish. 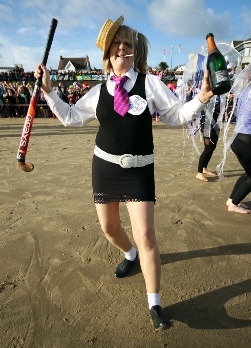 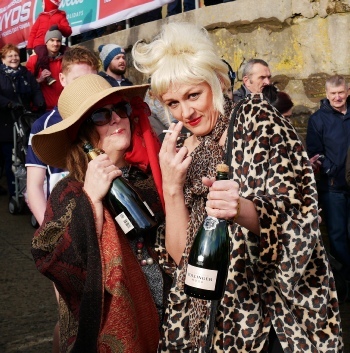 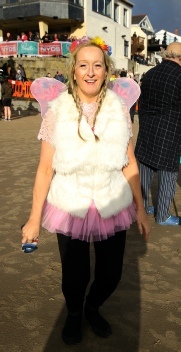 Sarah Cole won the Best Individual fancy dress as Absolutely Fabulous. 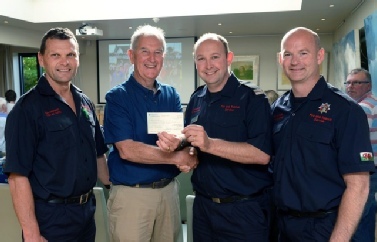 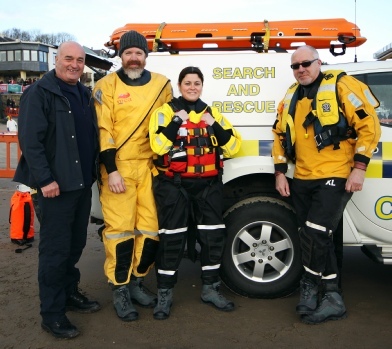 During the presentation Martyn Williams took time to thank everybody who was involved in making the 34th swim such a success, namely all the emergency services, safety personnel, stewards, bucket collectors and sponsors. 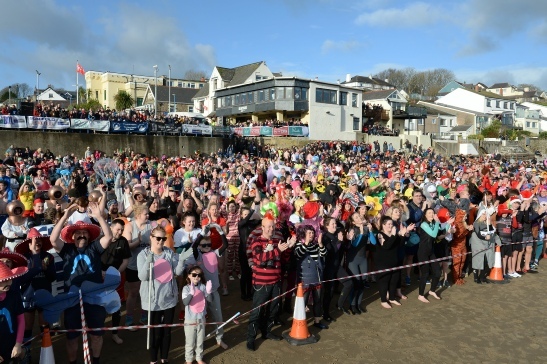 This was the first time the event had attracted over 2000 swimmers. 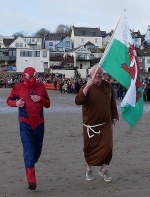 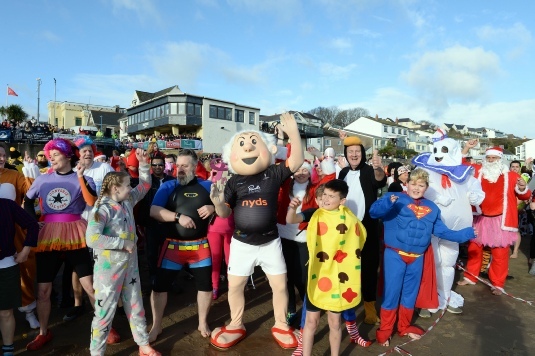 Saundersfoot New Year’s Swim would like to thank St Brides Spa Hotel for their hospitality and continued support. 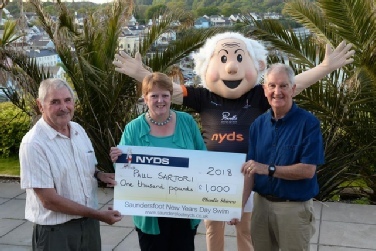 Plans are well under way for the 2019 NYDS. 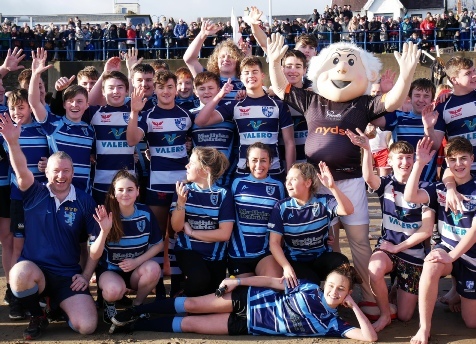 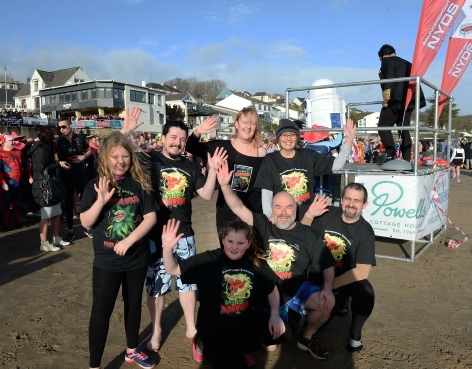 2018 Swim Sponsors: Powells Cottage Holidays, 1 Formula Fitness, Broughton Leisure, Elston Construction, Folly Farm, Harbour Wealth Financial Services, Lewis, Lewis & Co Ltd, Mike Wealleans UPVC, Neil Finlay Cars, Pembrokeshire Tyres, Princes Gate Spring Water, Saundersfoot Pharmacy, Saundersfoot Pleasure Boats, Scaffold 2000, Sue’s Pantry, Sunnyvale Holiday Park, Sytner BMW, Taf Valley Coaches, Tees R Us, Tenby Glass and Tojaz of Saundersfoot. 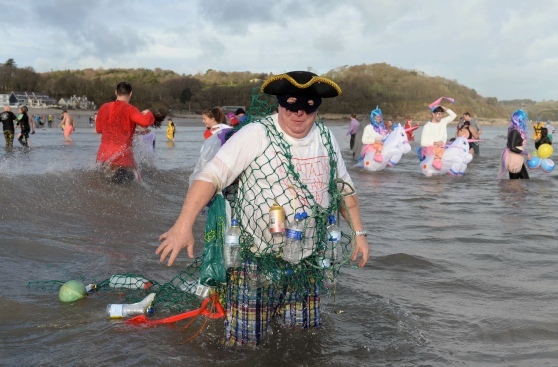 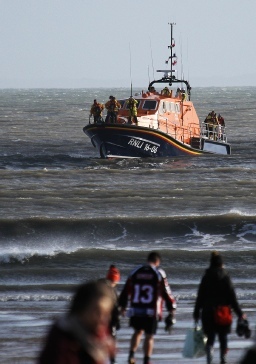 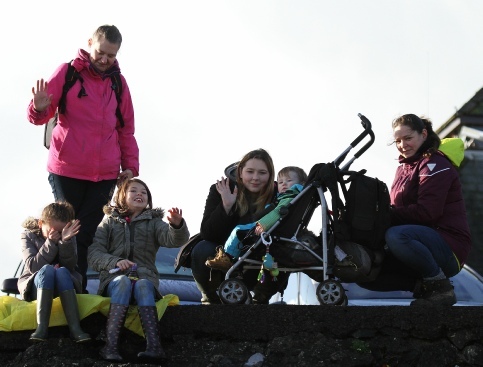 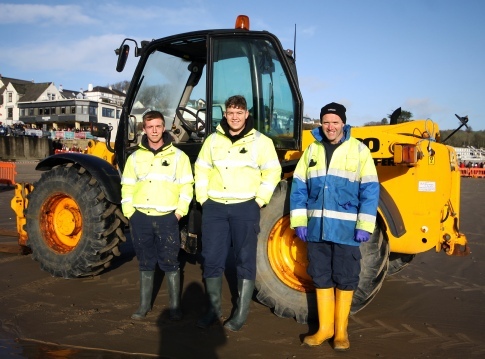 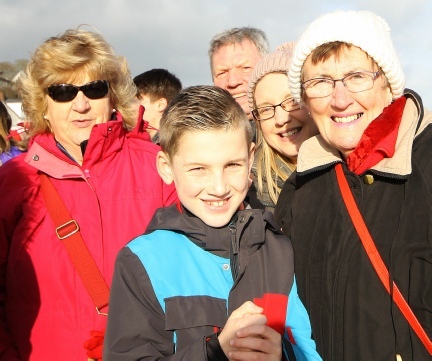 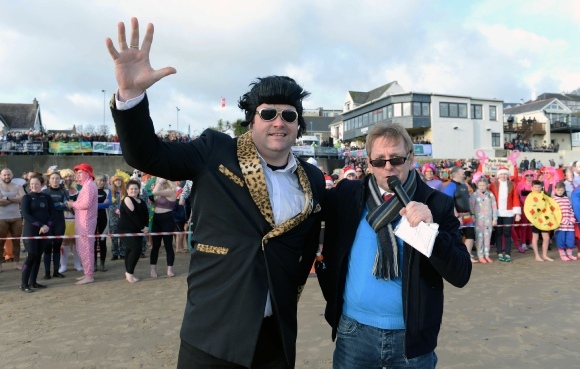 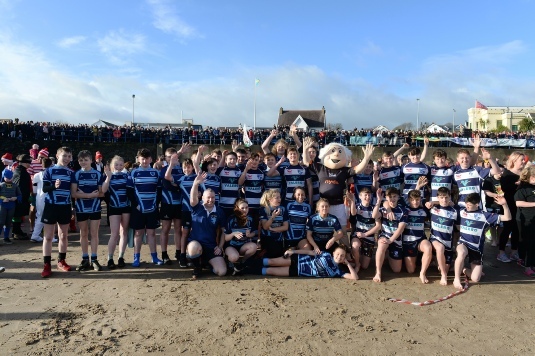 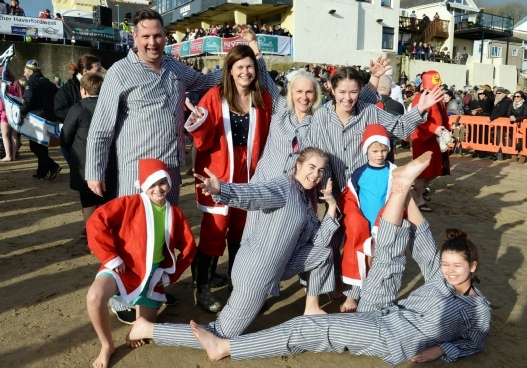 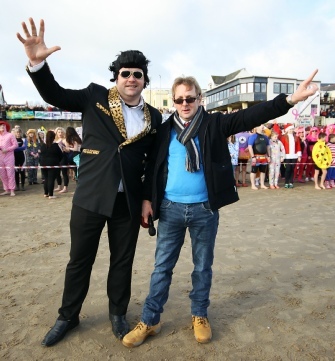 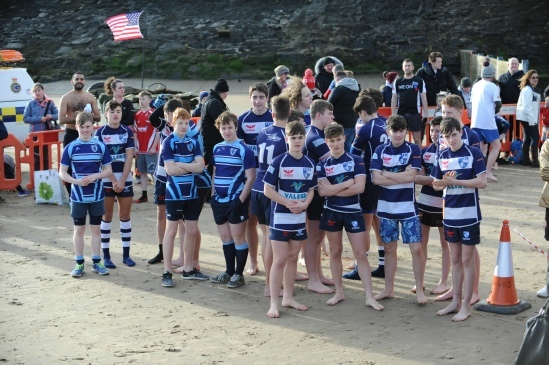 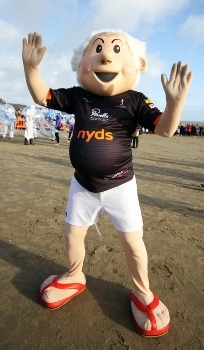 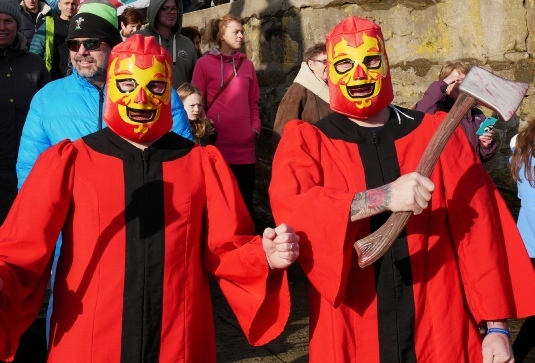 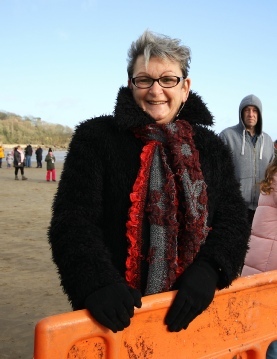 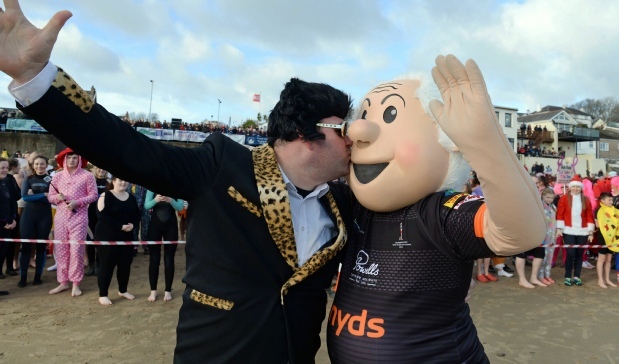 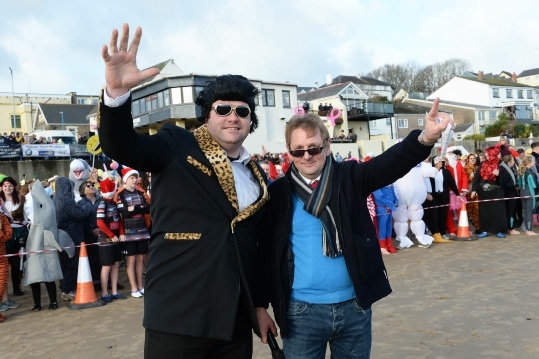 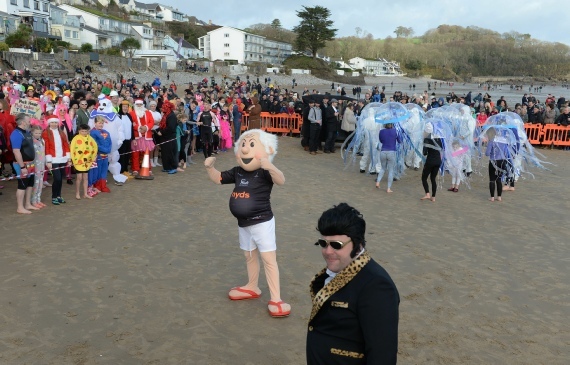 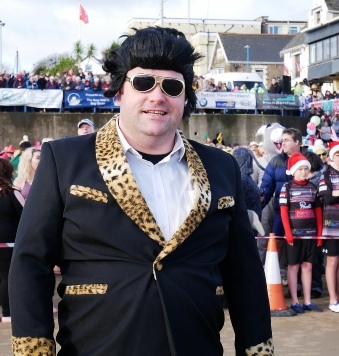 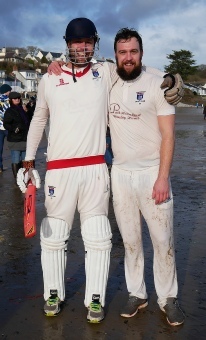 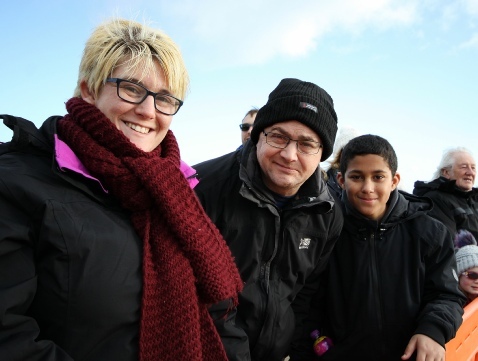 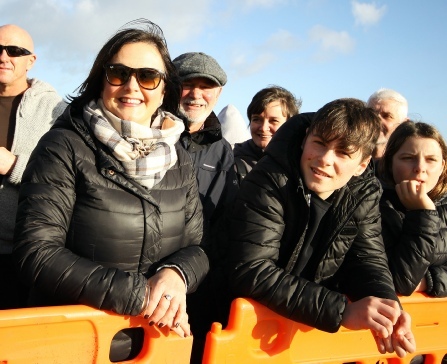 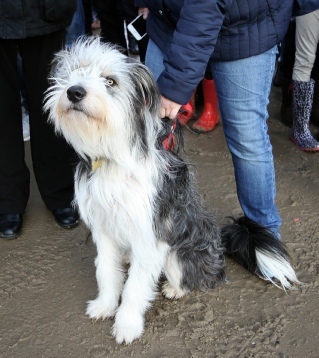 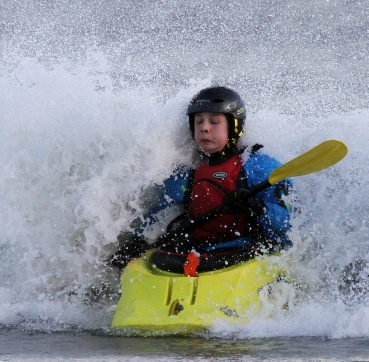 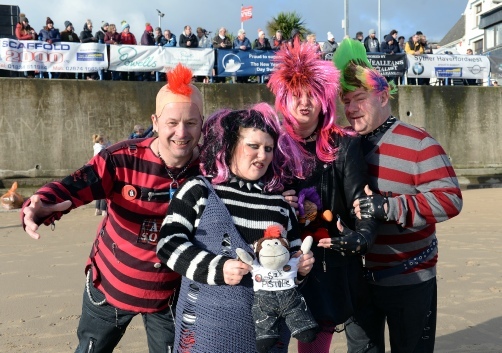 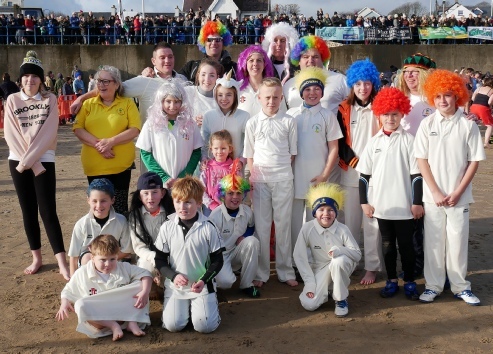 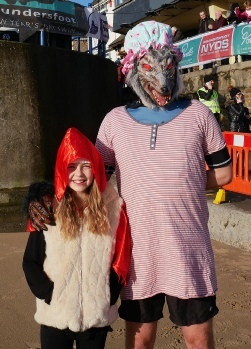 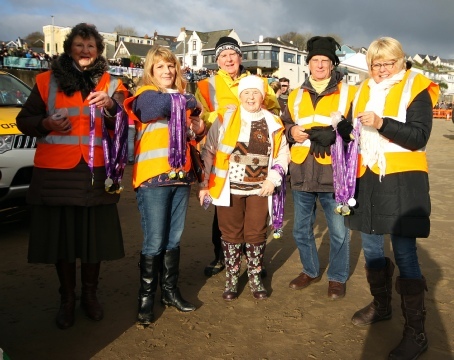 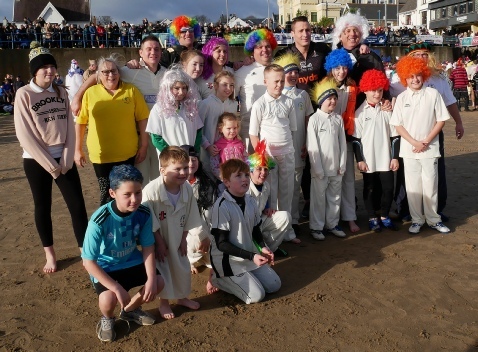 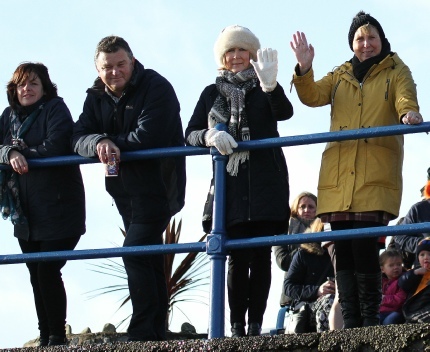 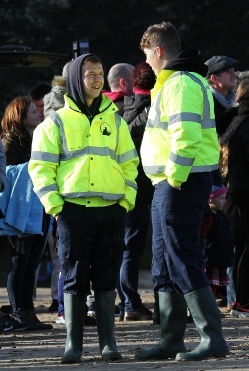 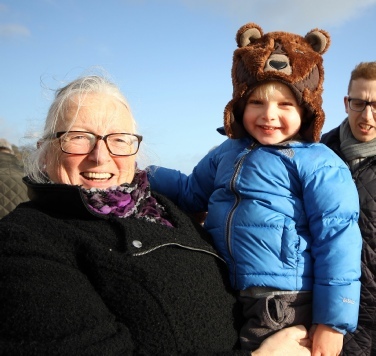 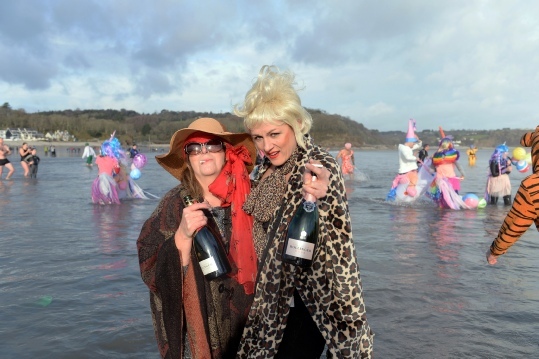 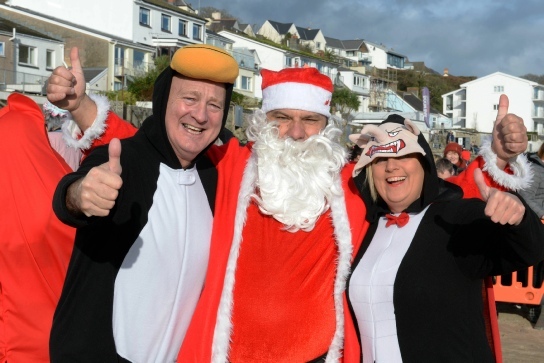 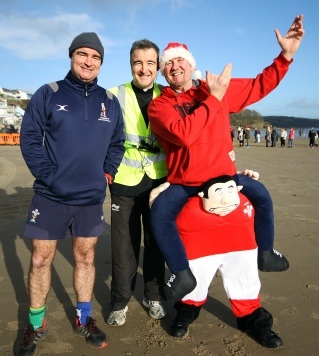 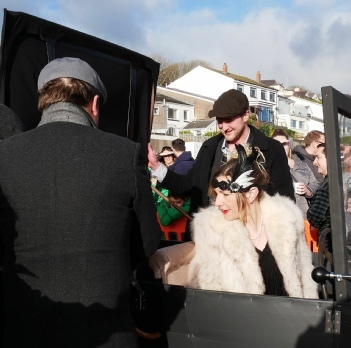 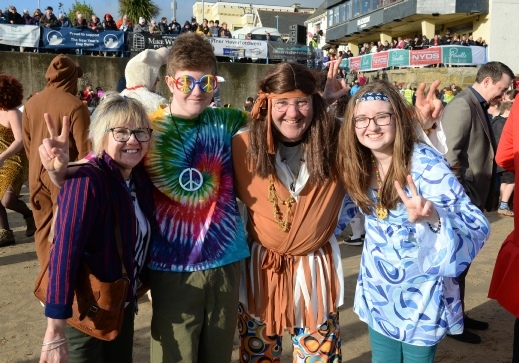 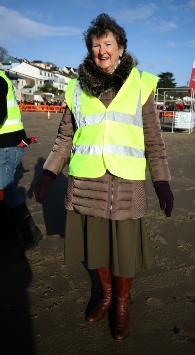 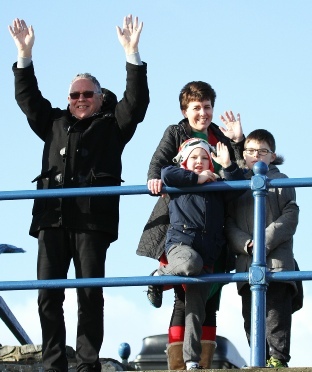 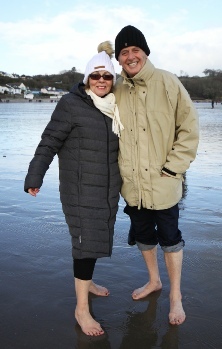 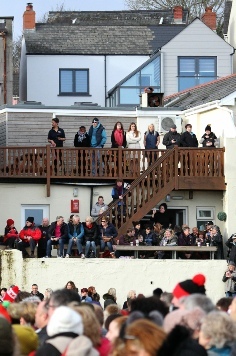 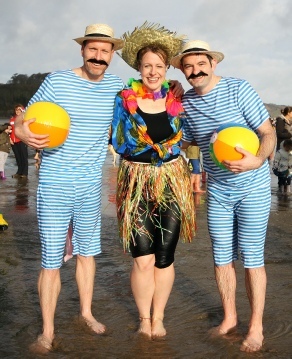 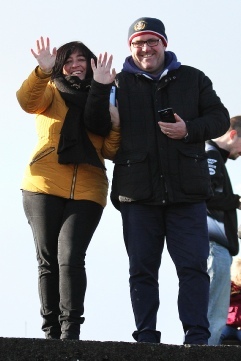 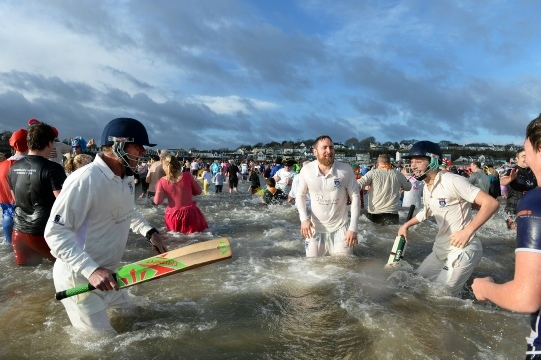 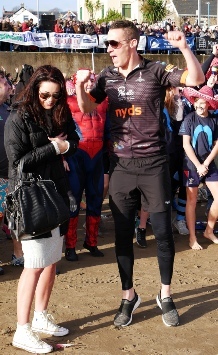 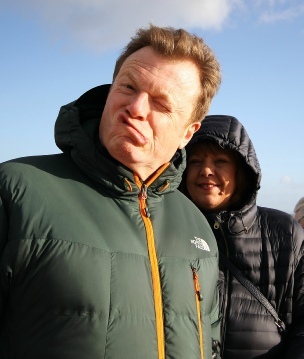 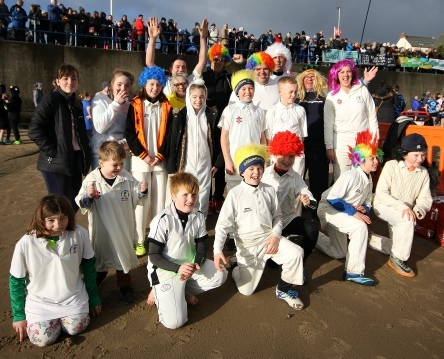 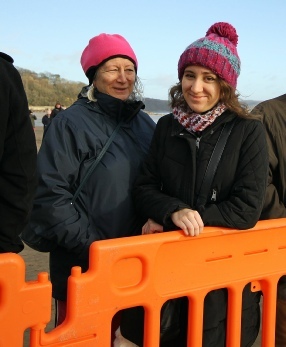 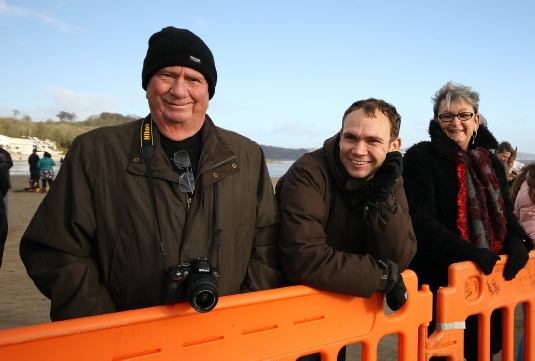 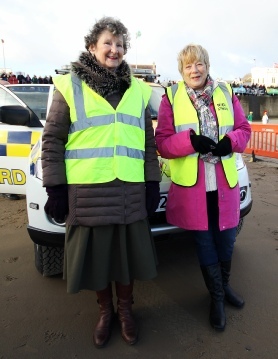 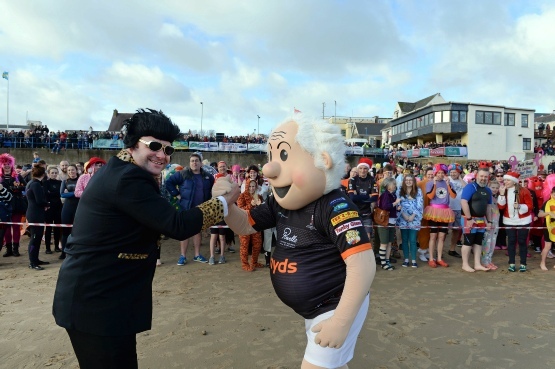 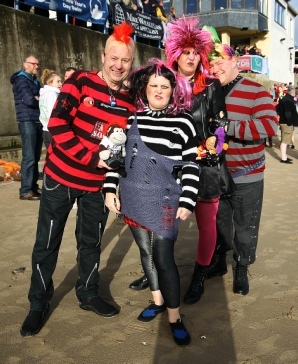 Saundersfoot Beach was the place to be to welcome the New Year in in style. 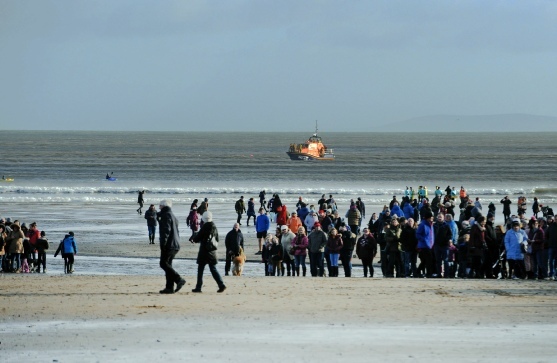 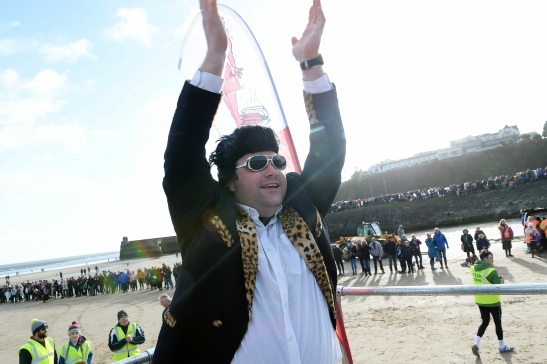 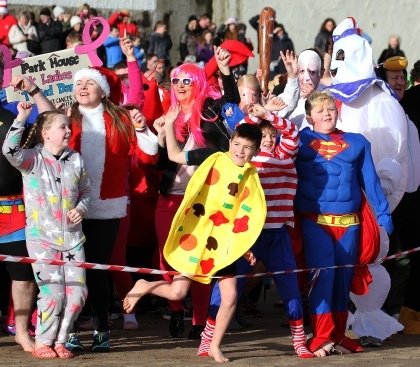 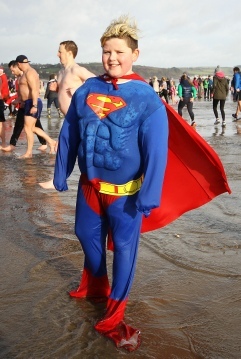 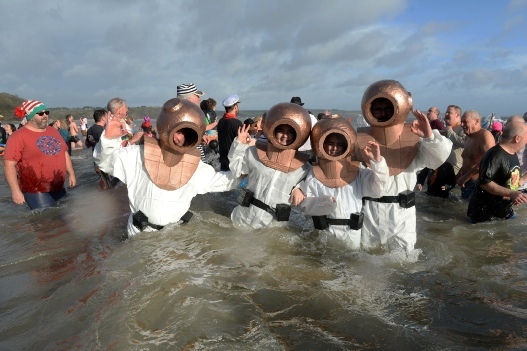 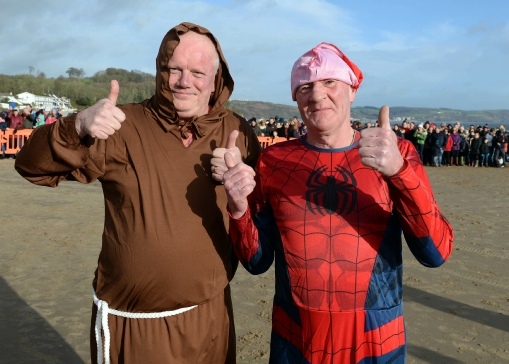 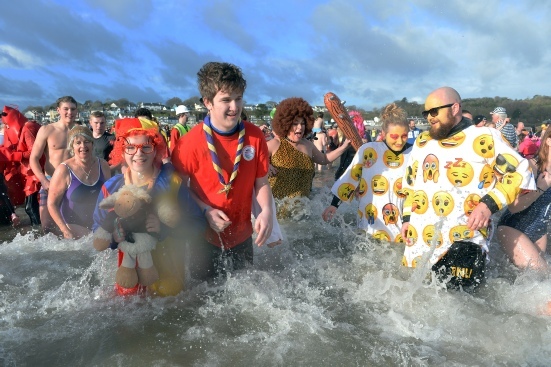 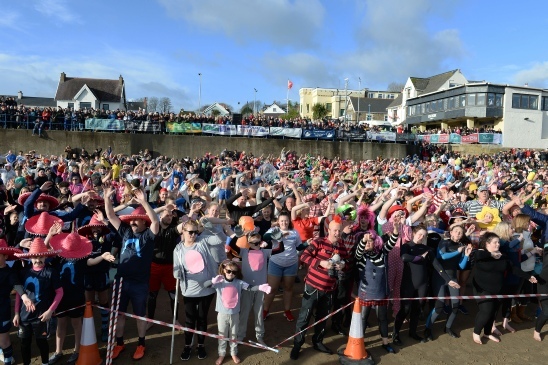 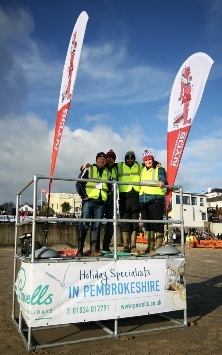 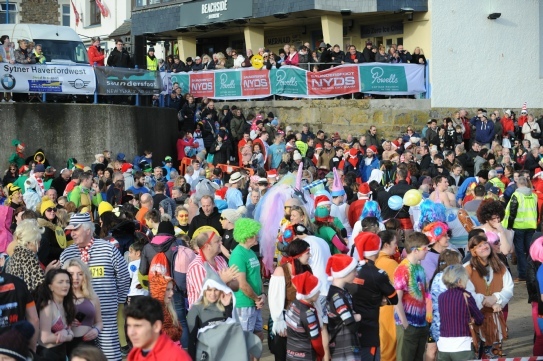 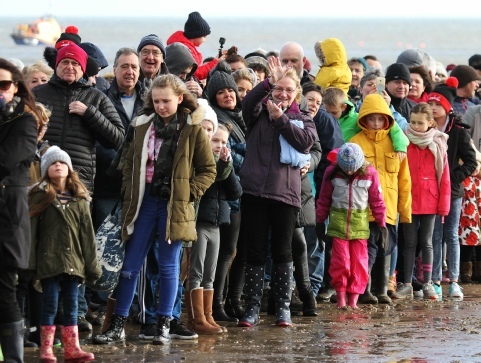 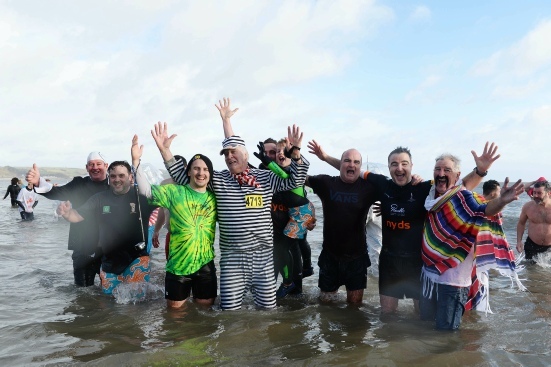 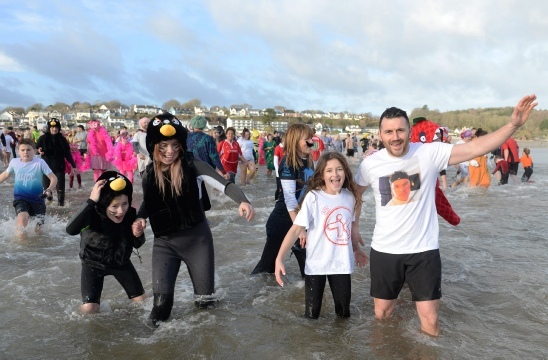 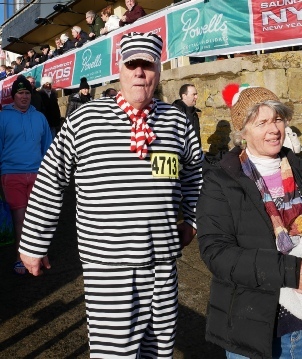 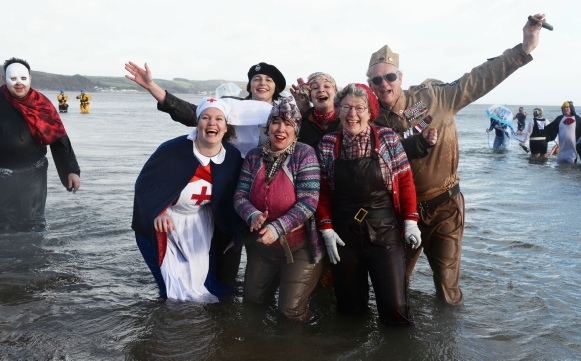 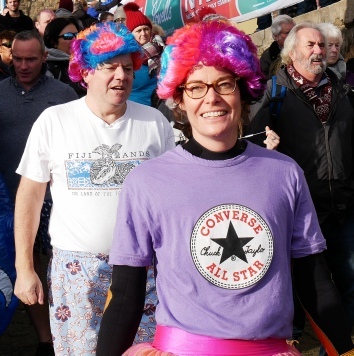 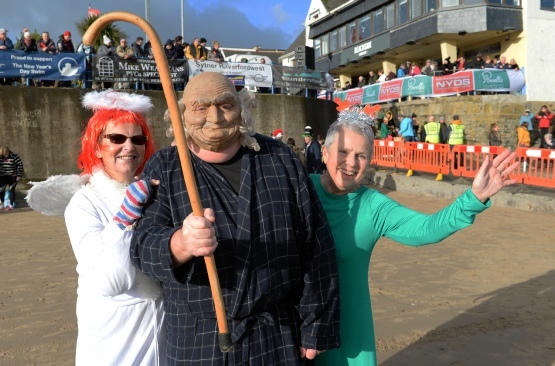 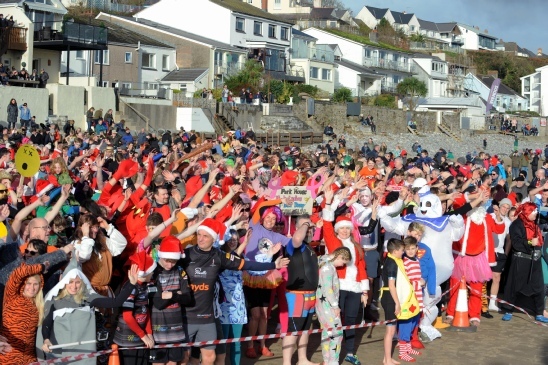 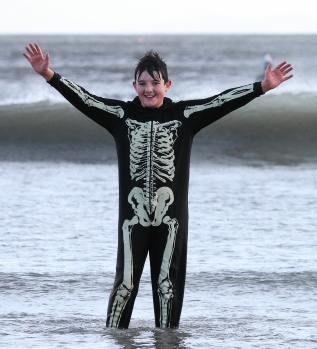 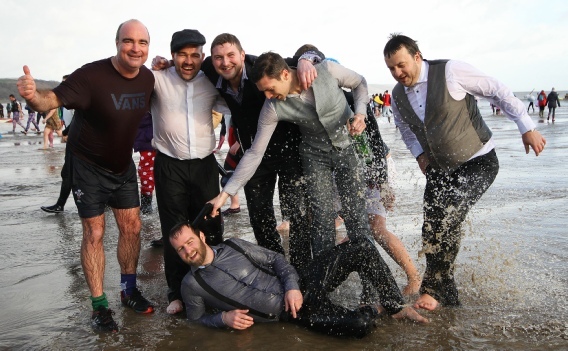 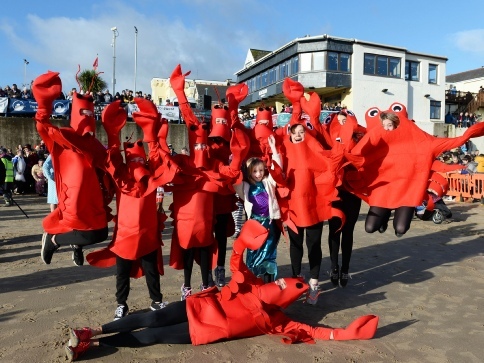 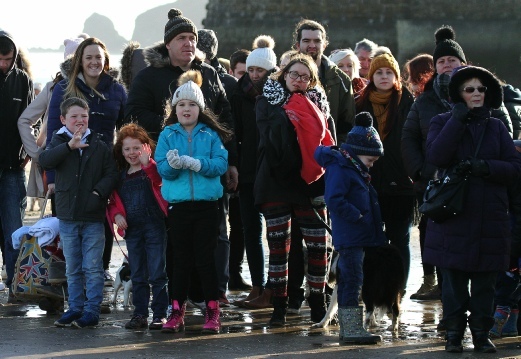 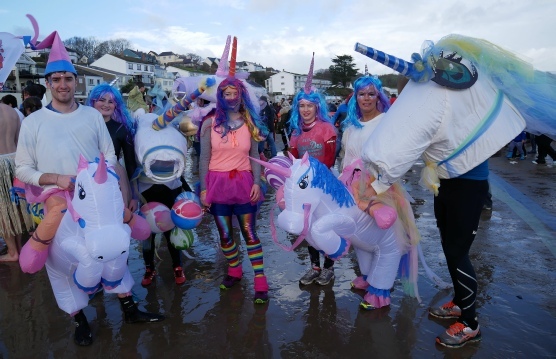 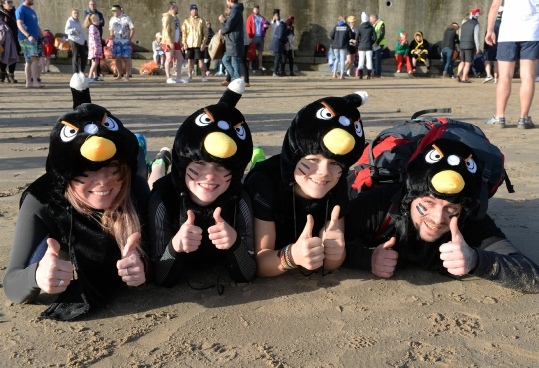 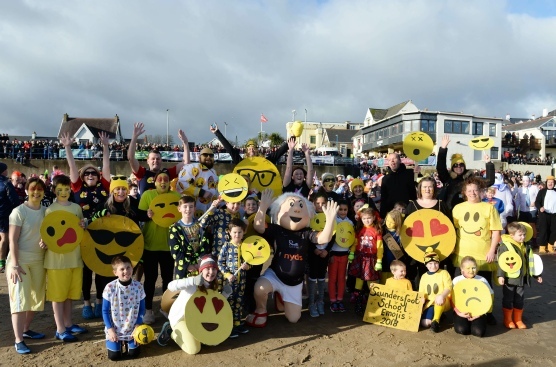 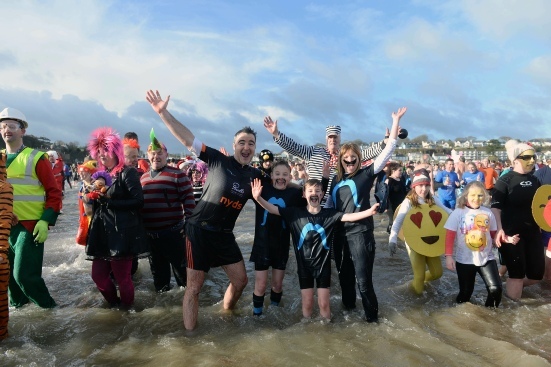 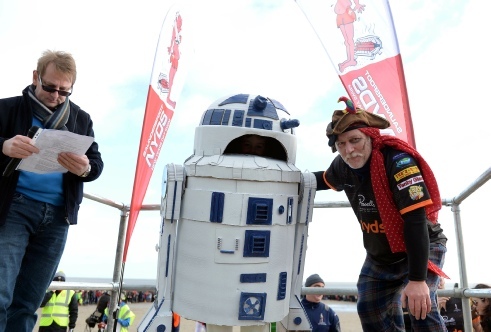 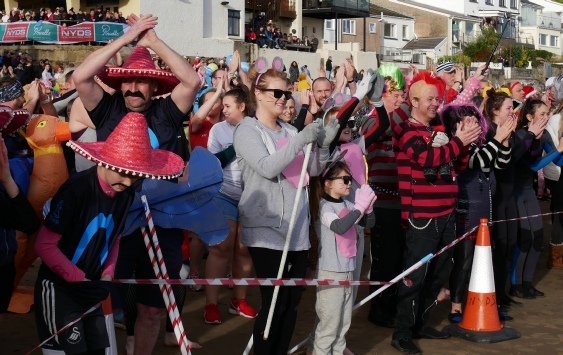 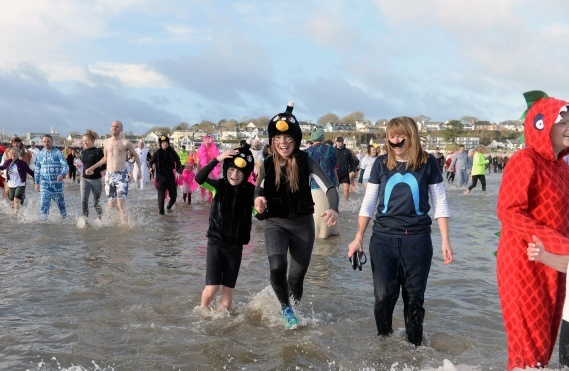 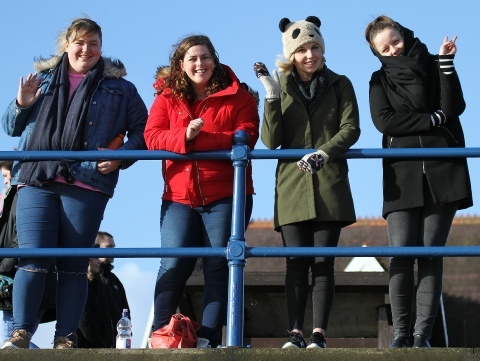 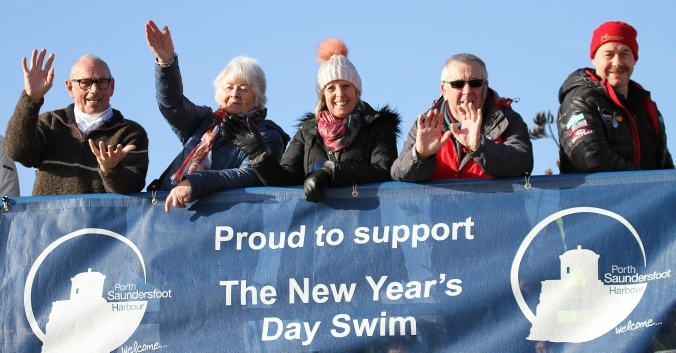 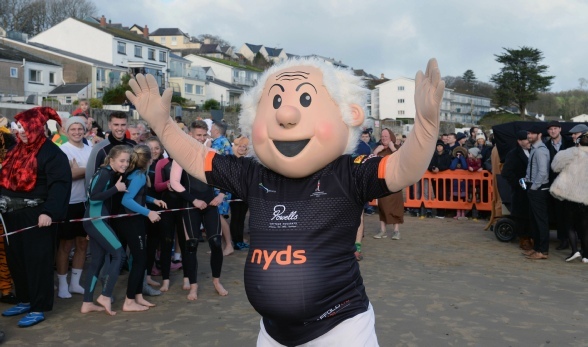 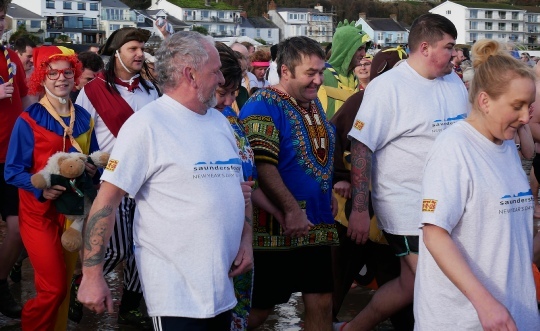 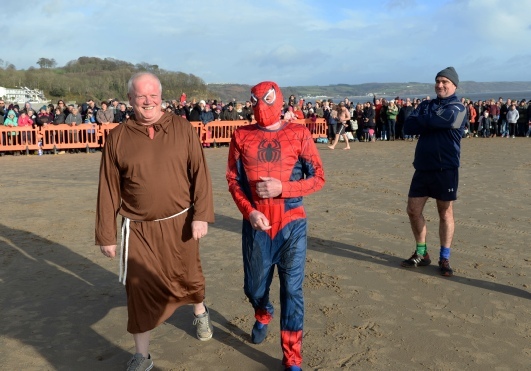 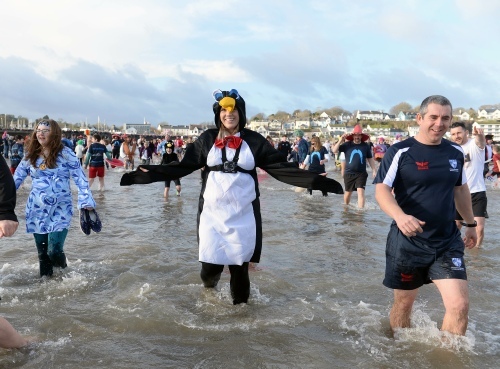 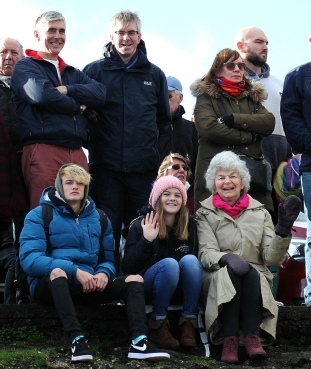 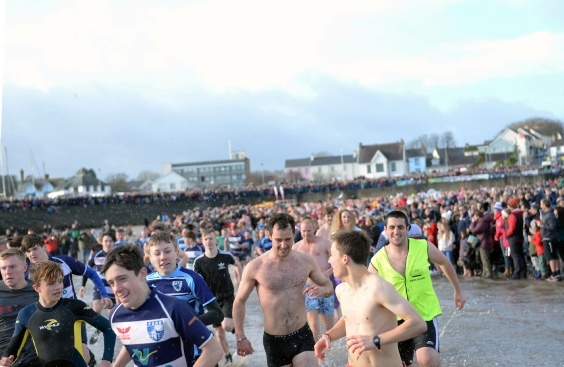 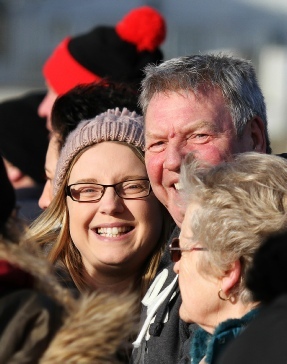 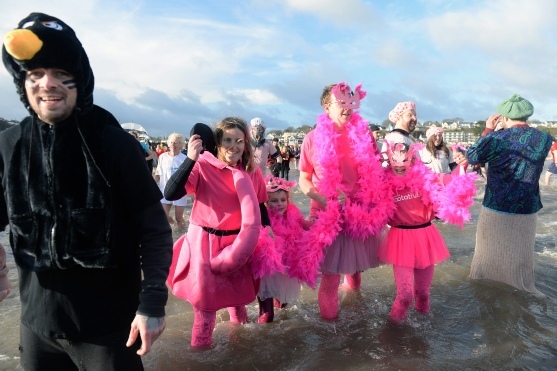 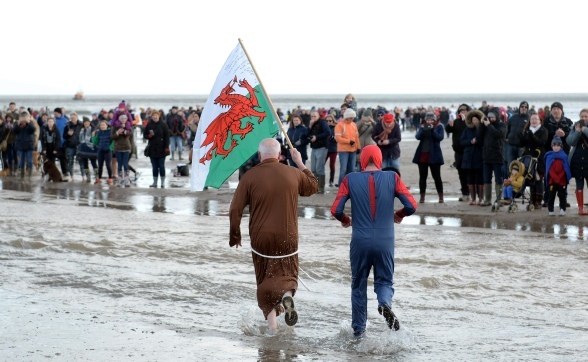 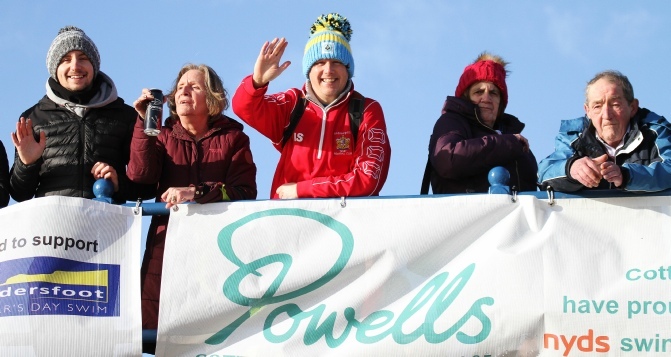 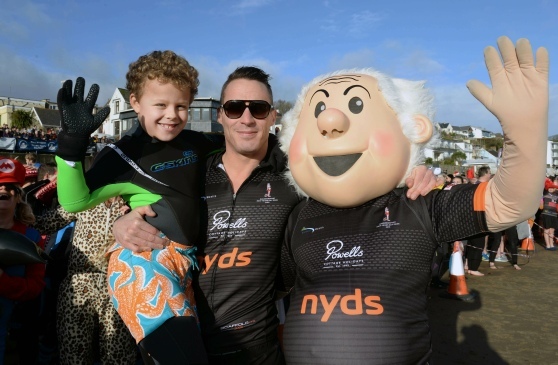 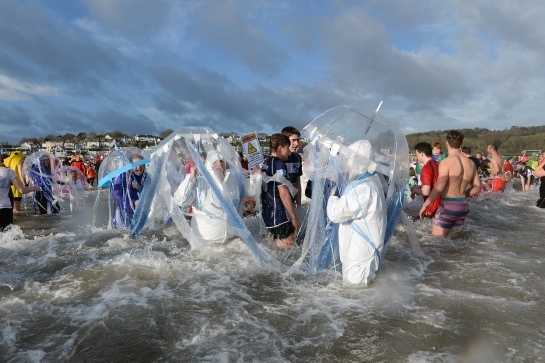 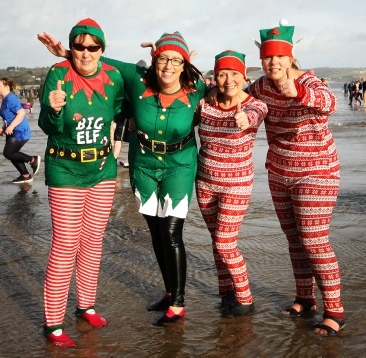 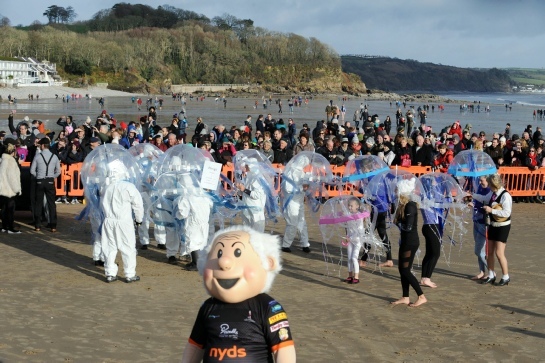 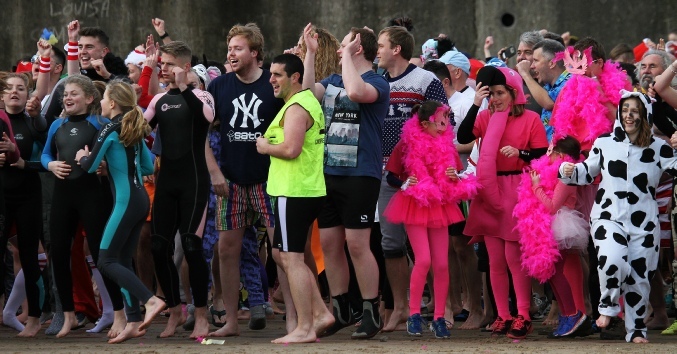 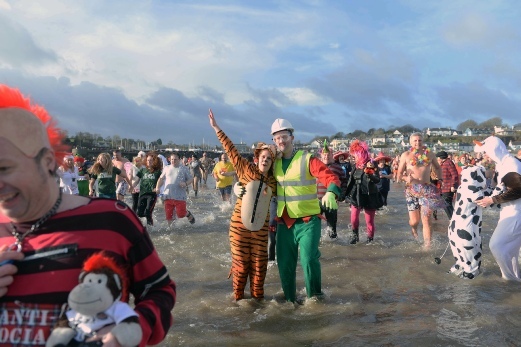 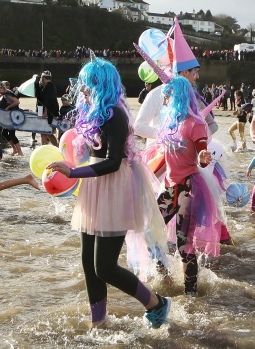 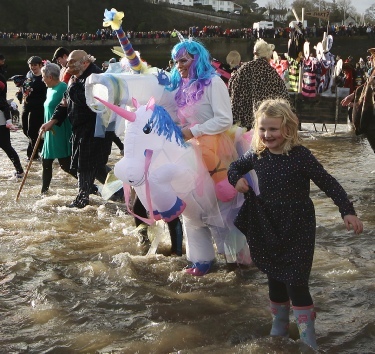 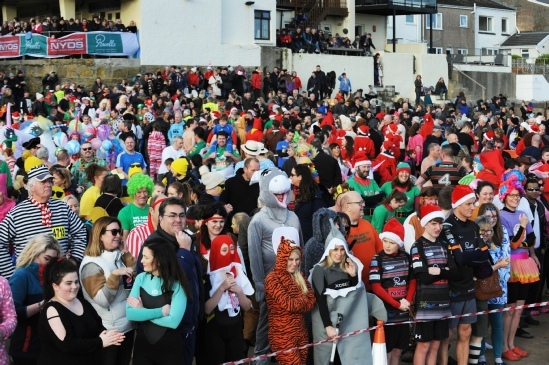 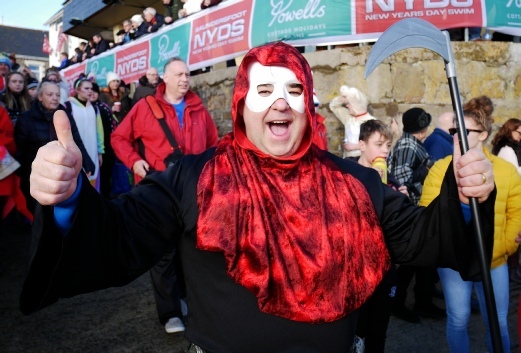 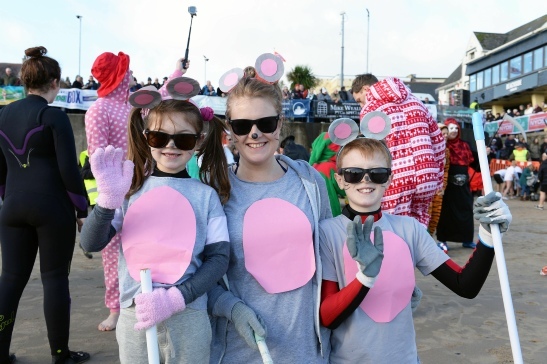 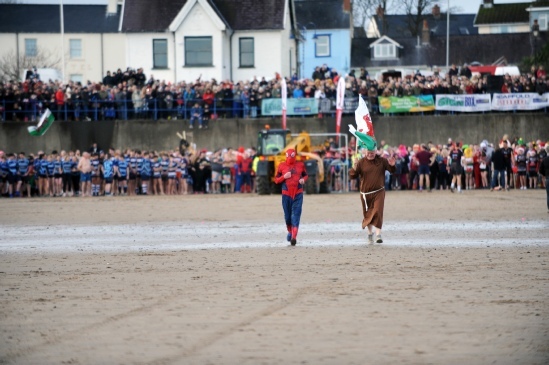 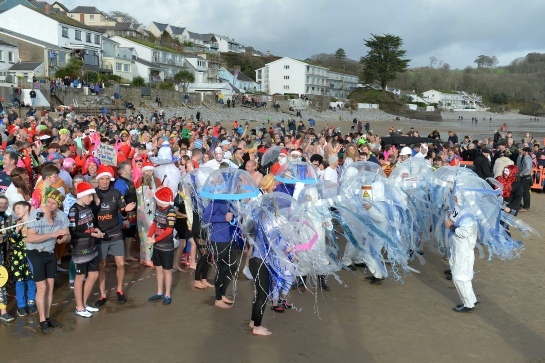 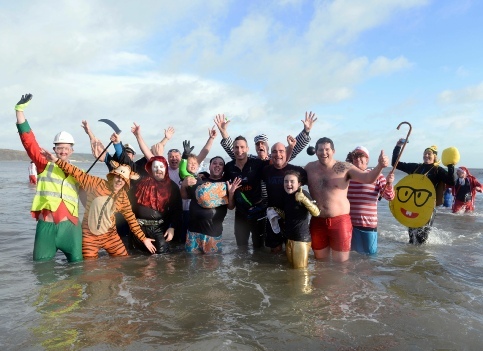 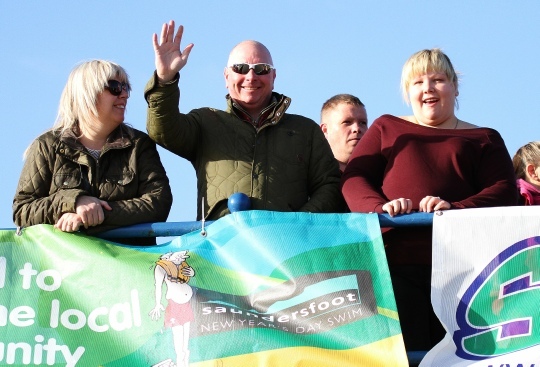 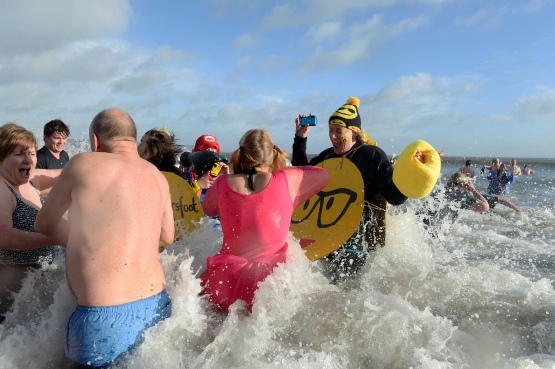 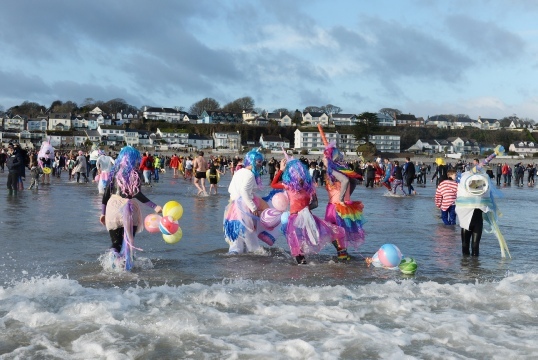 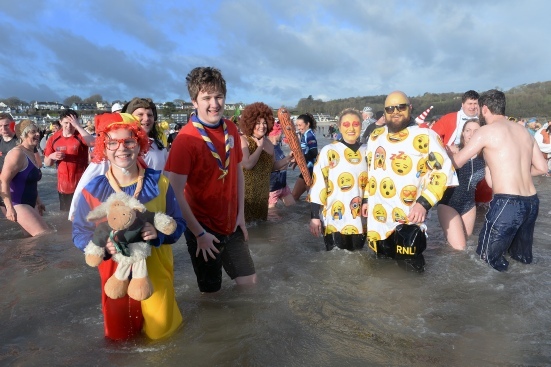 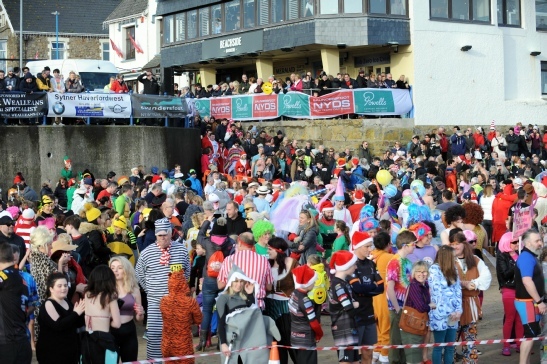 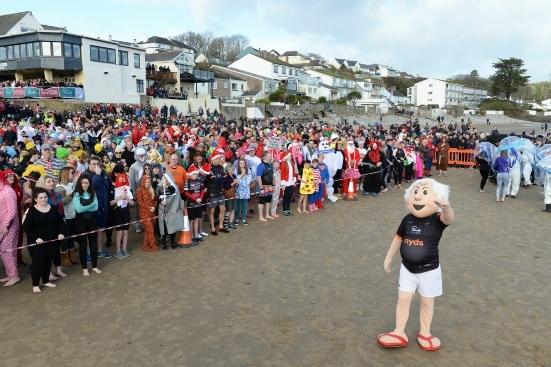 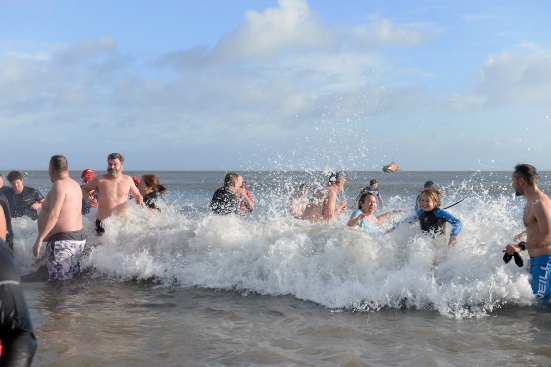 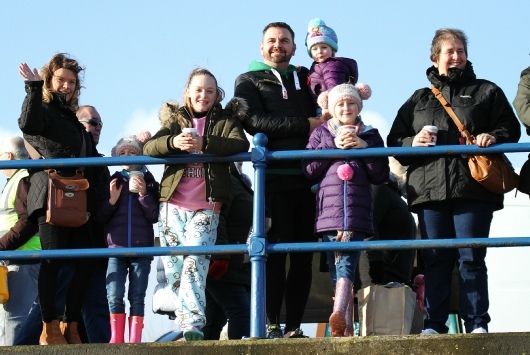 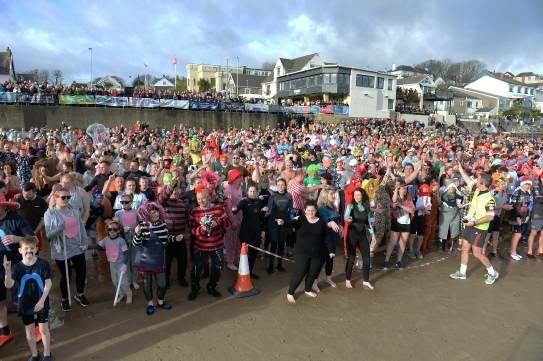 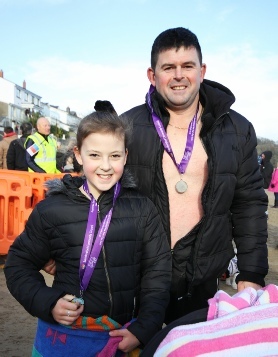 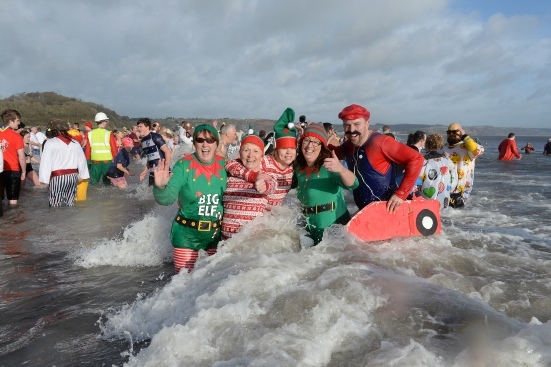 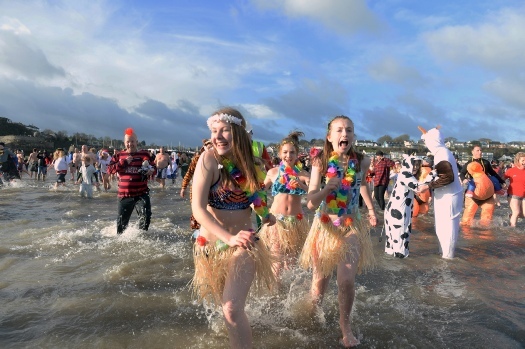 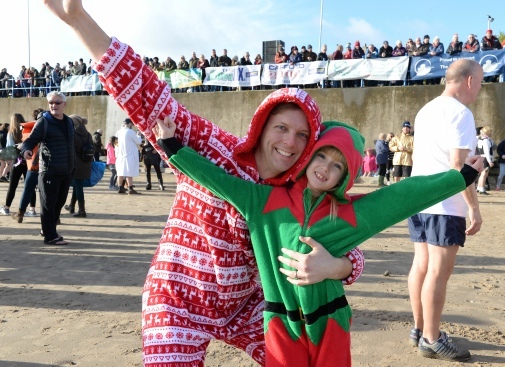 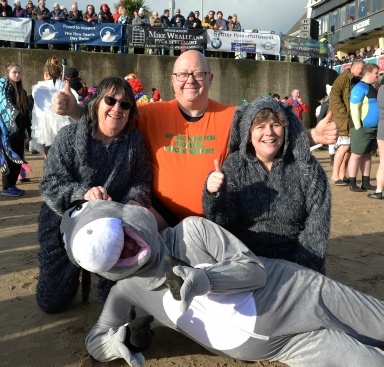 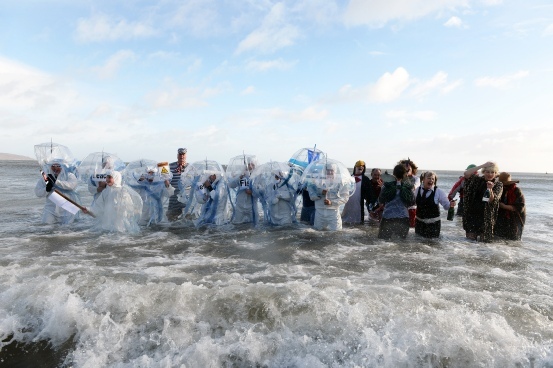 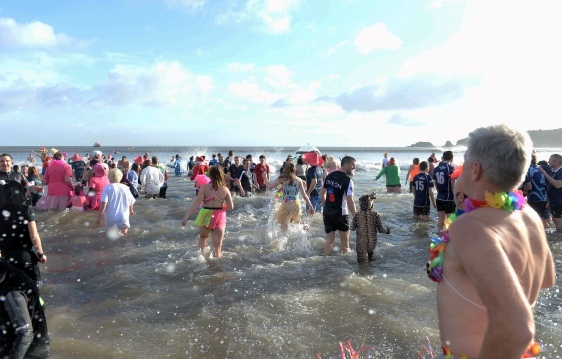 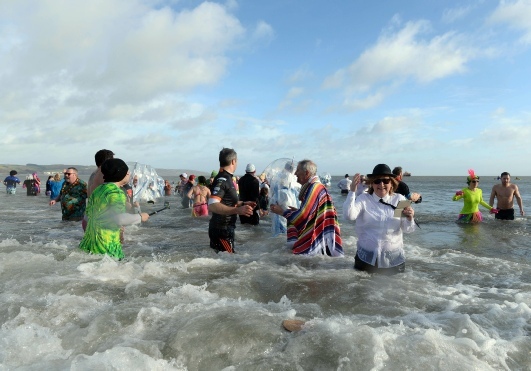 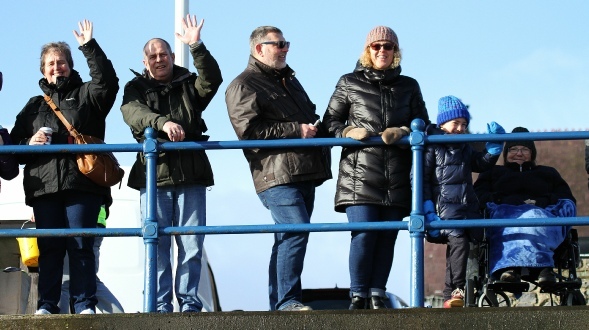 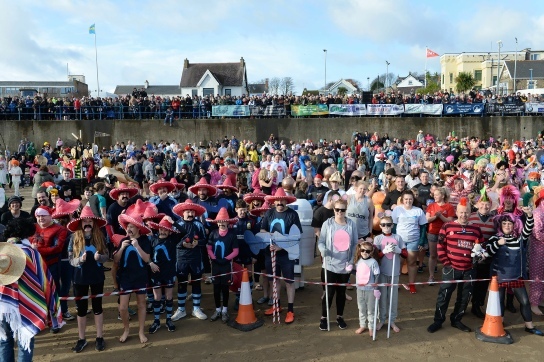 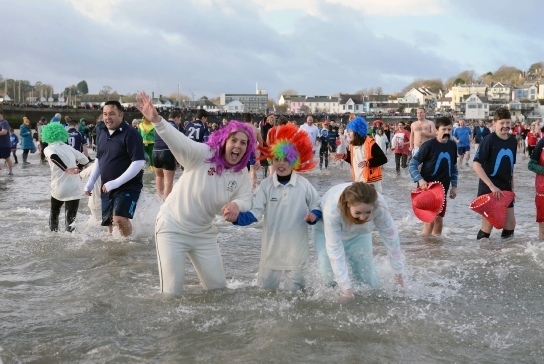 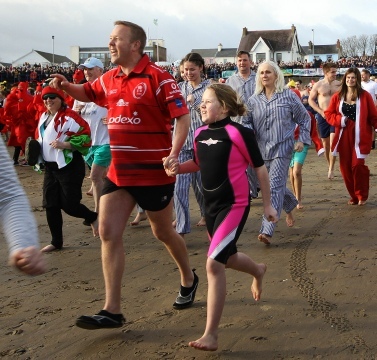 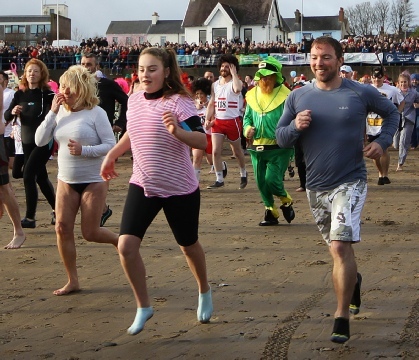 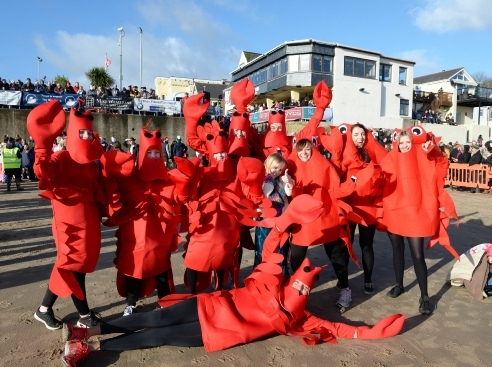 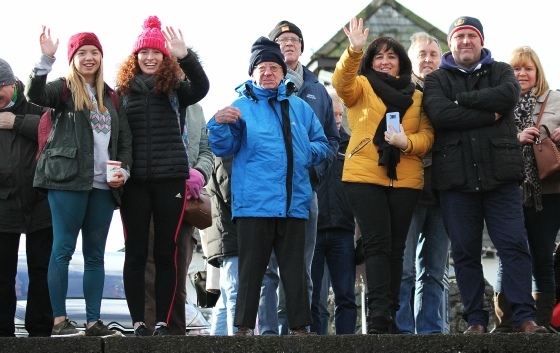 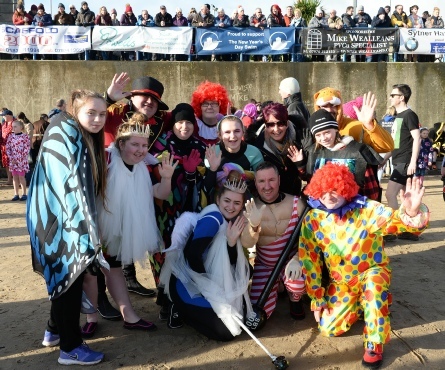 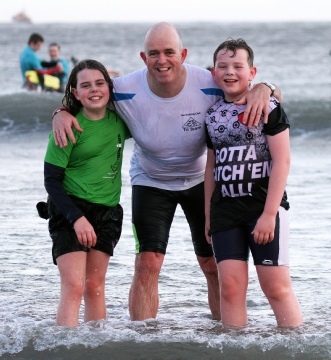 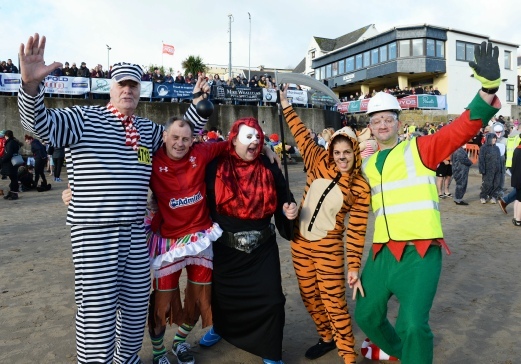 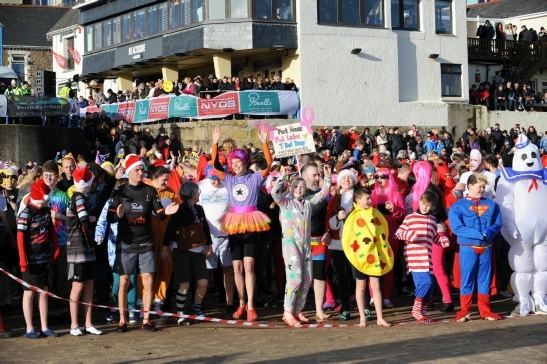 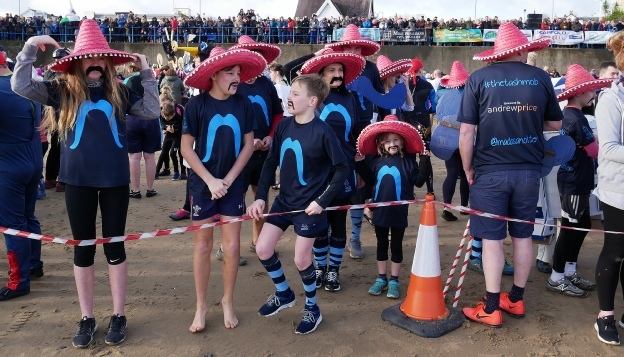 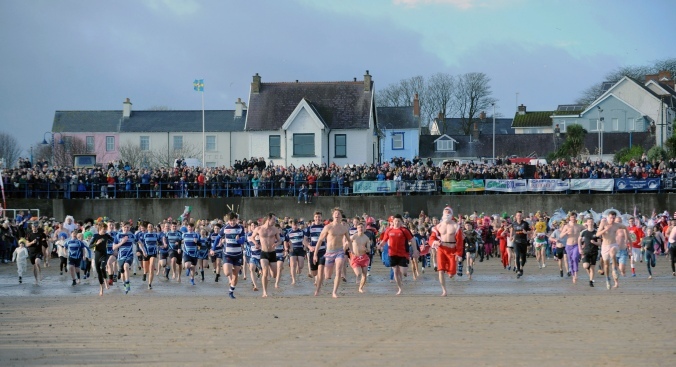 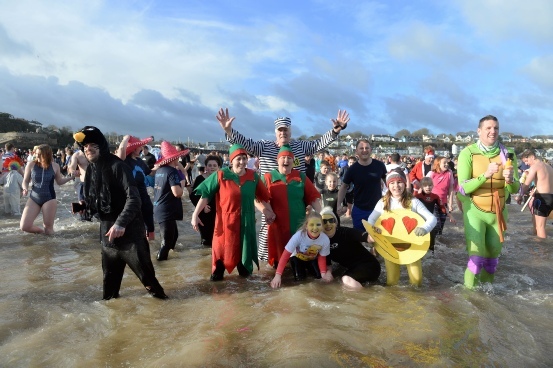 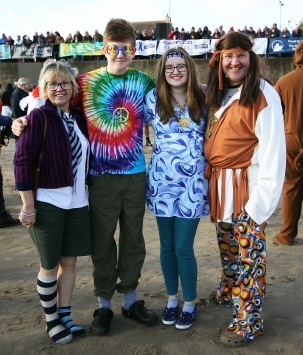 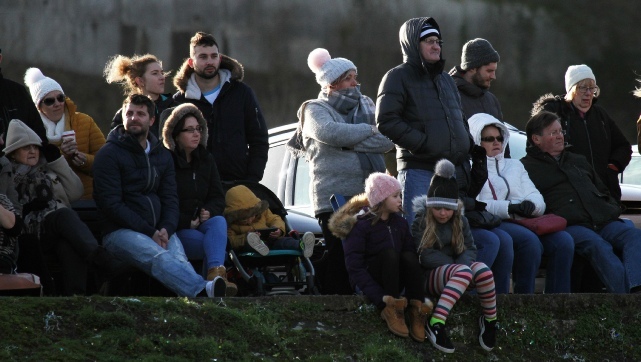 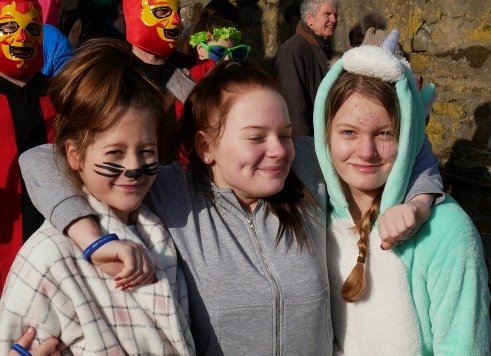 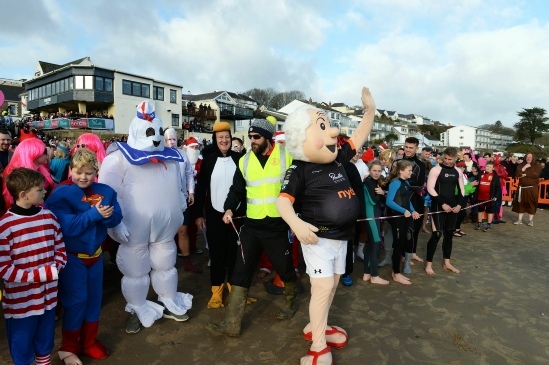 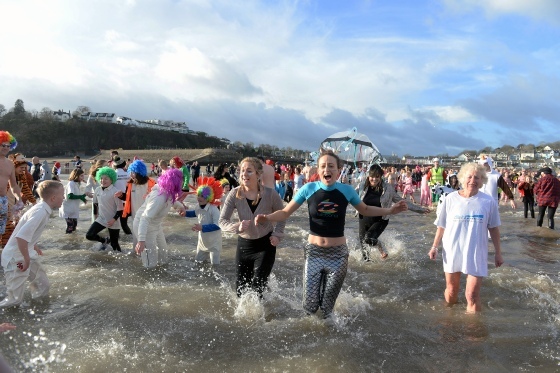 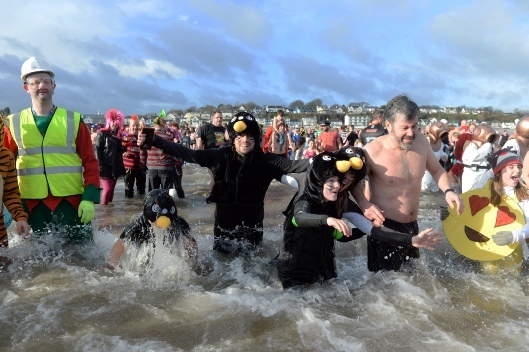 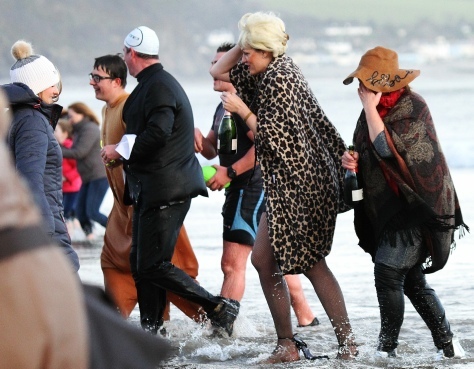 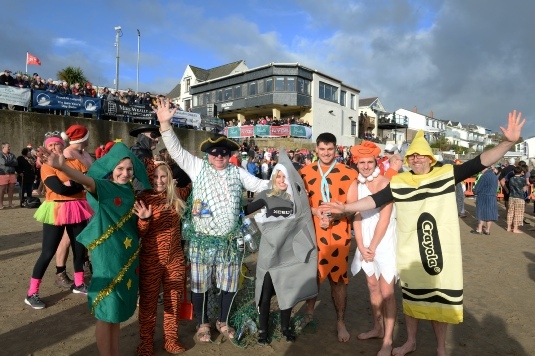 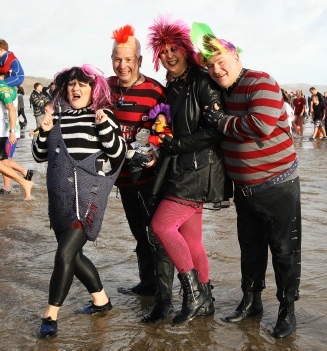 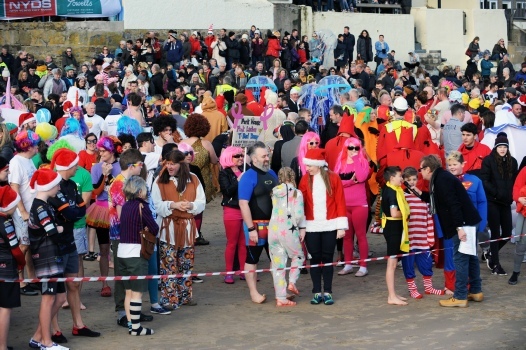 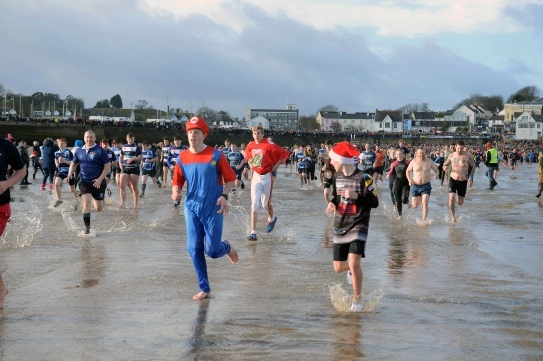 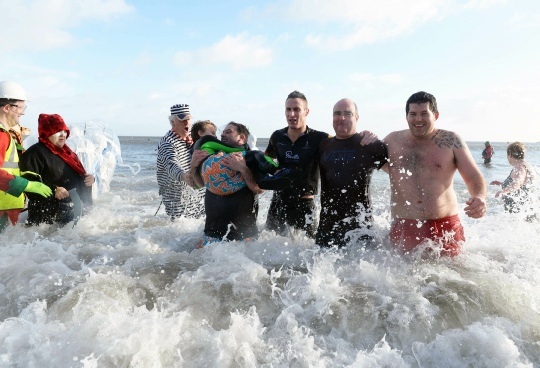 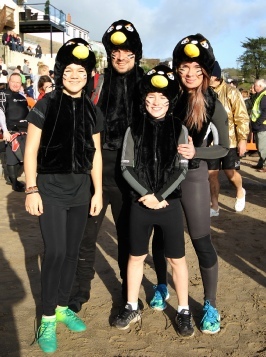 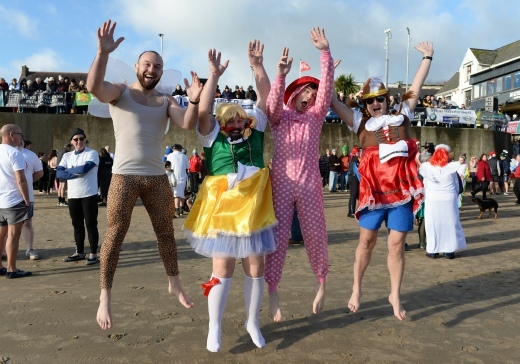 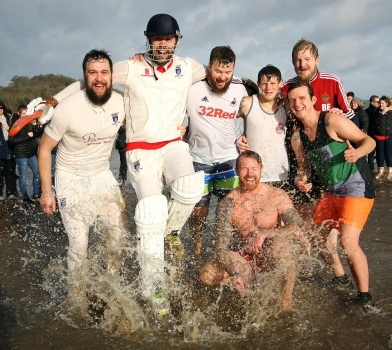 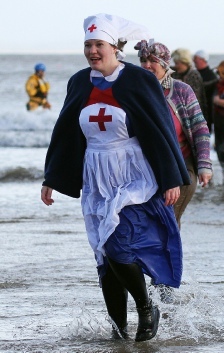 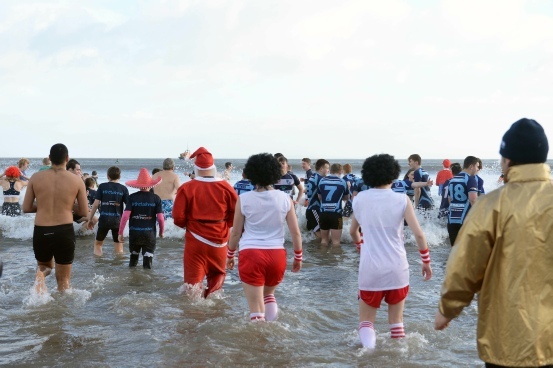 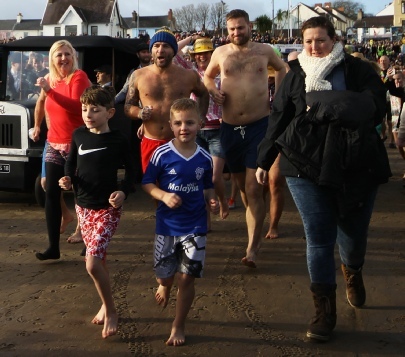 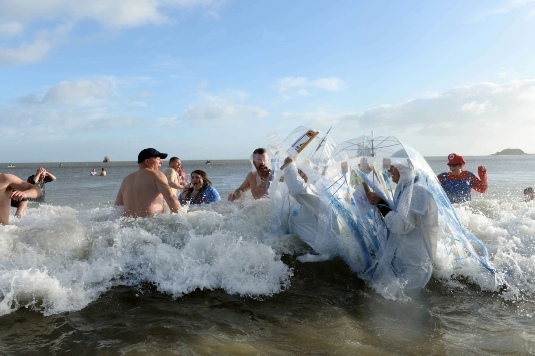 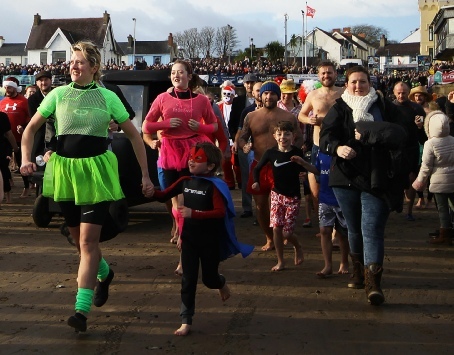 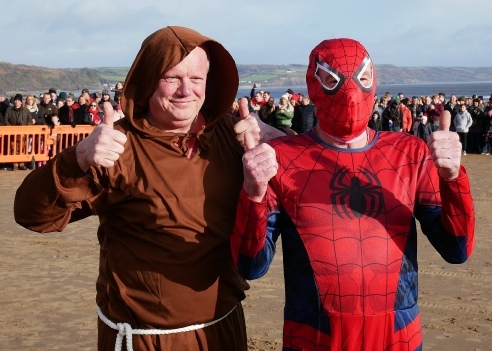 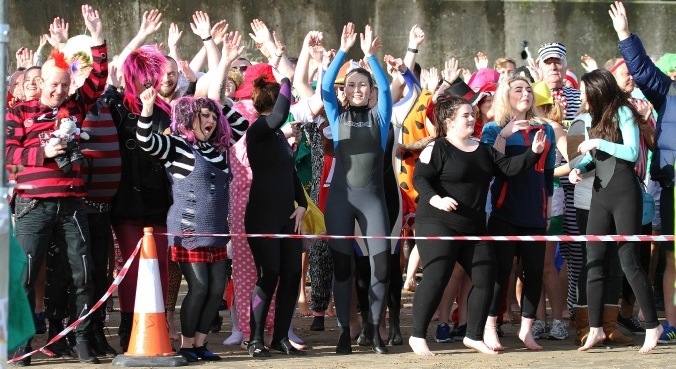 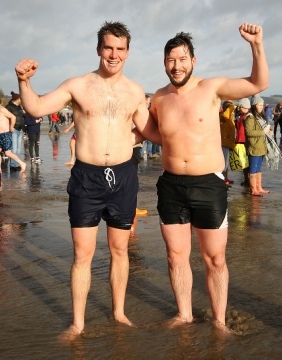 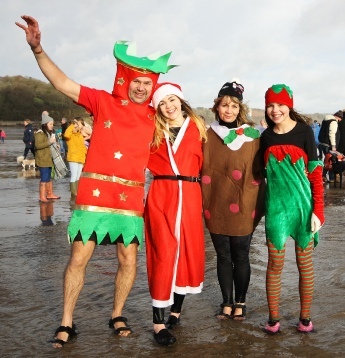 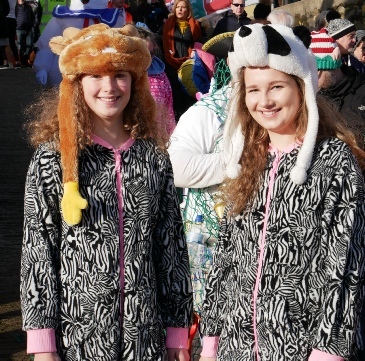 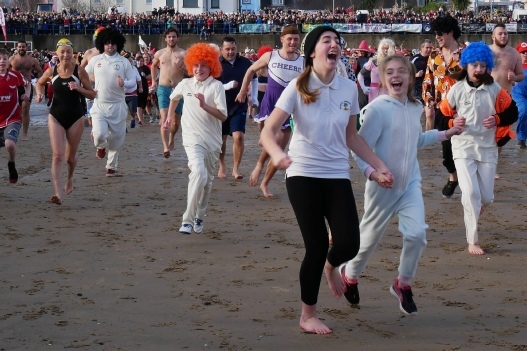 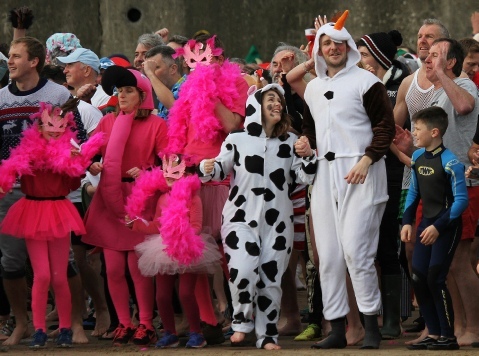 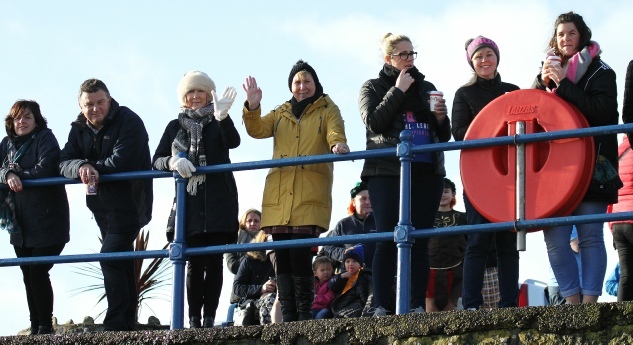 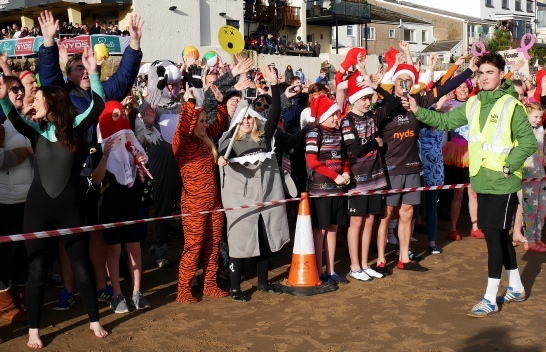 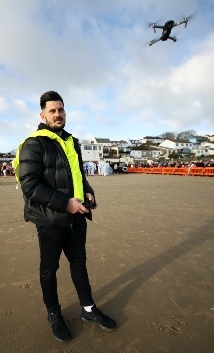 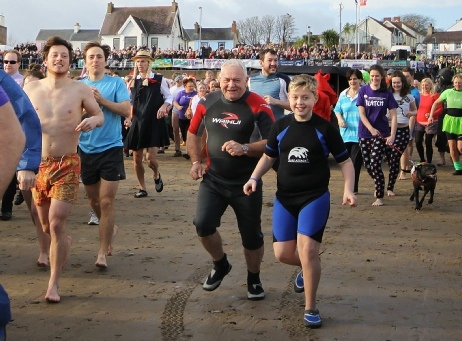 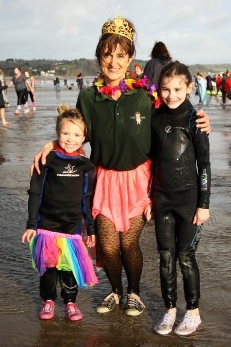 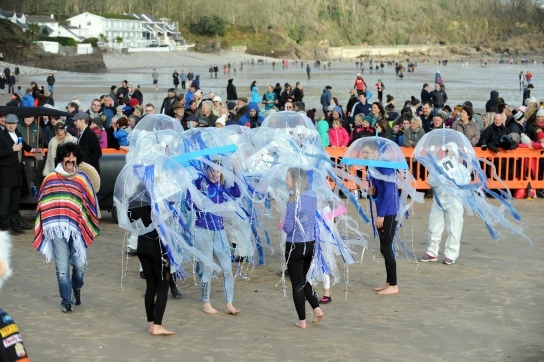 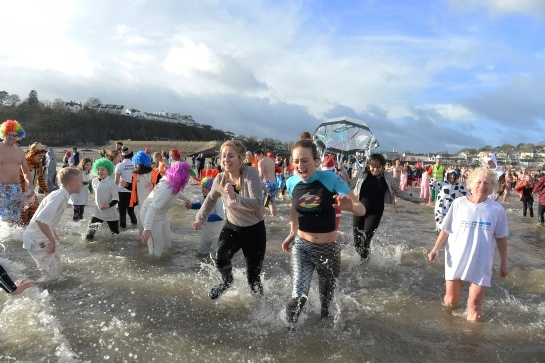 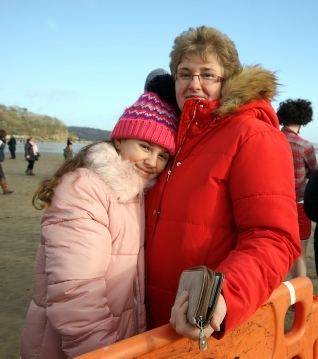 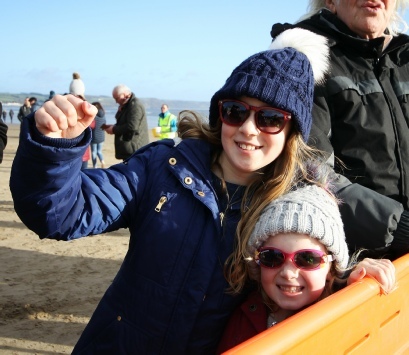 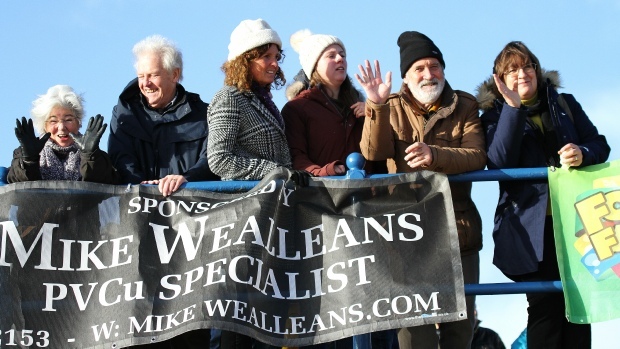 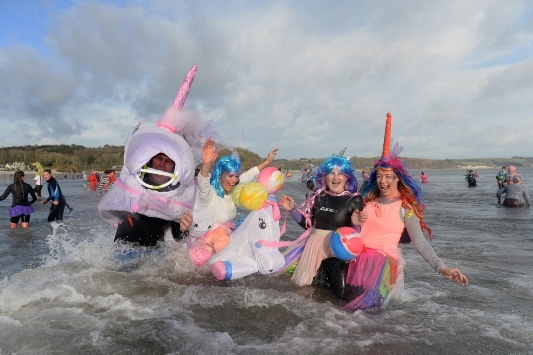 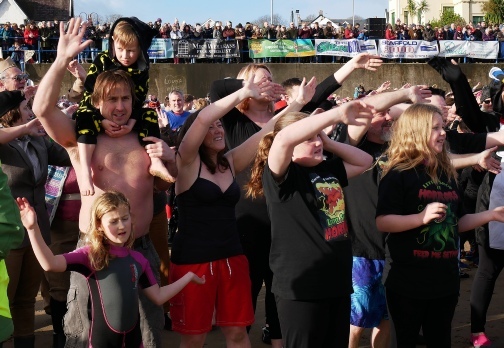 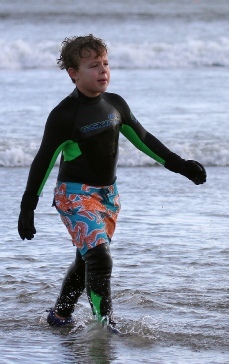 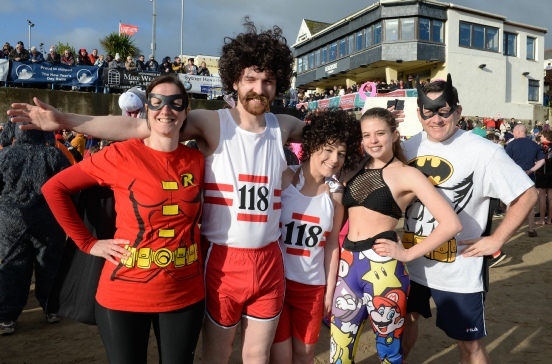 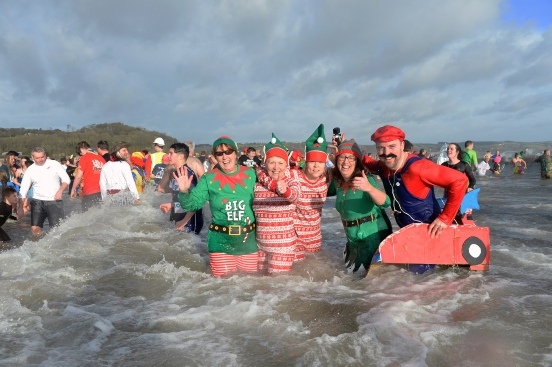 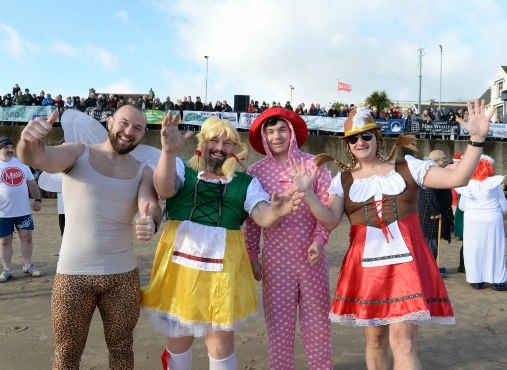 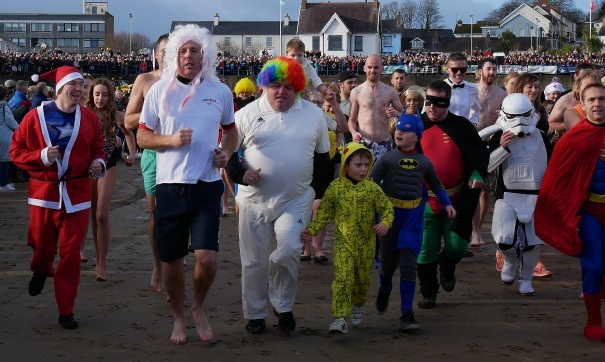 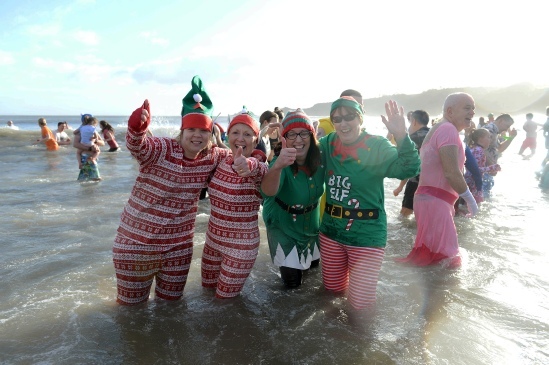 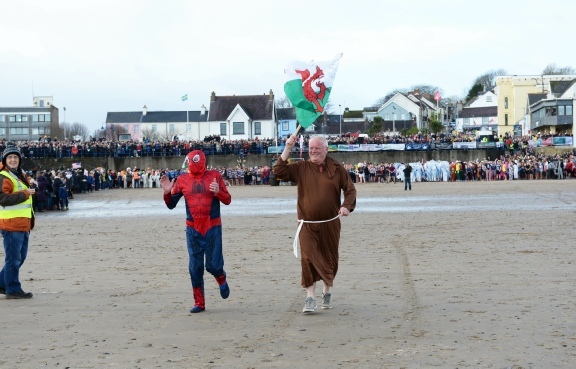 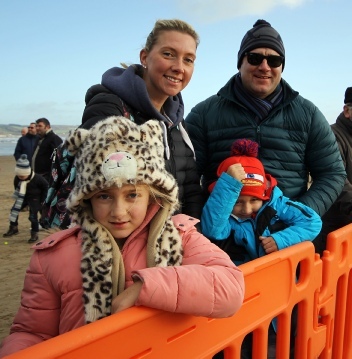 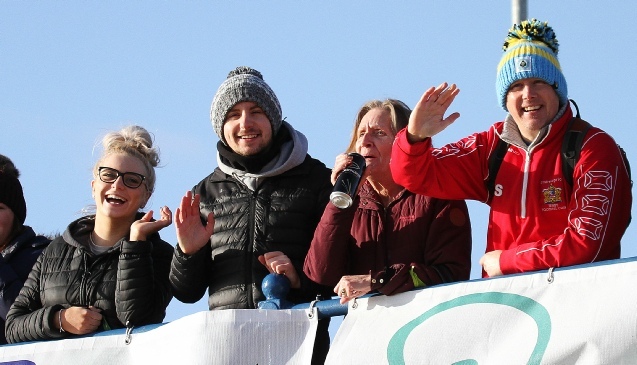 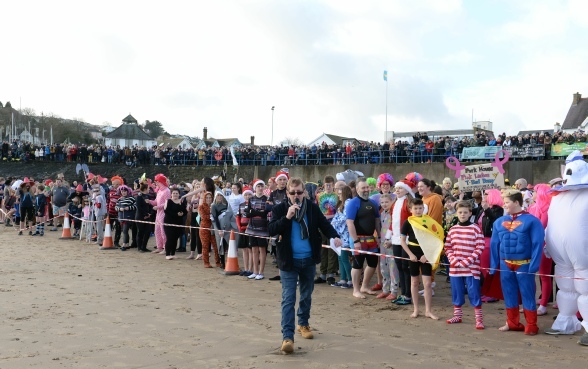 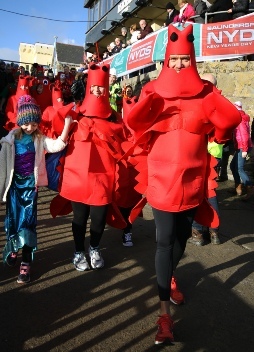 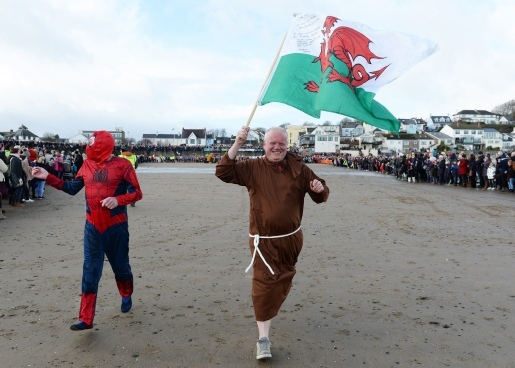 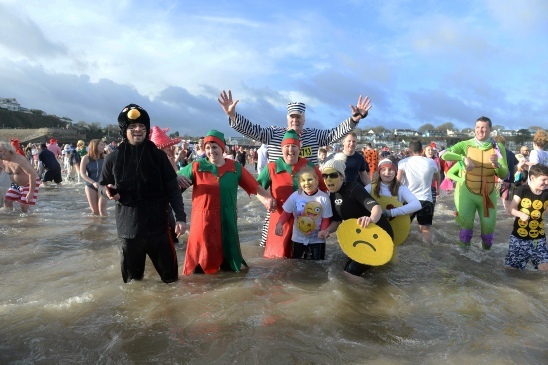 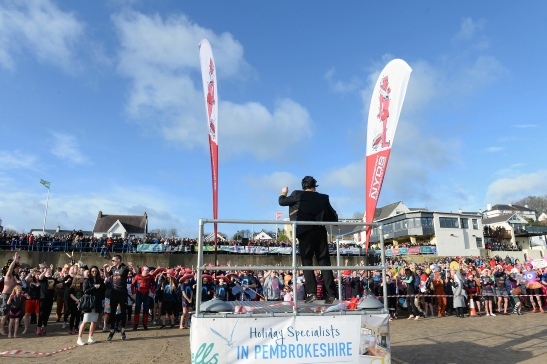 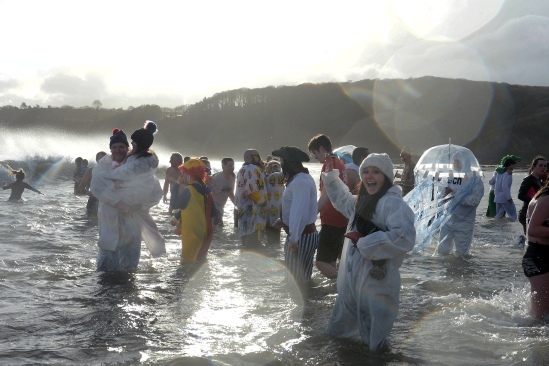 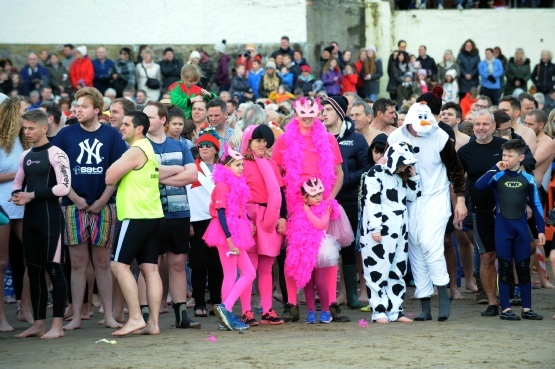 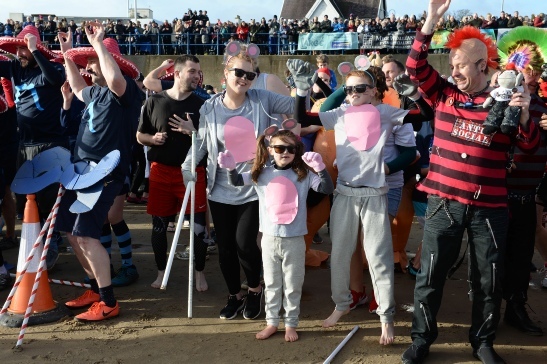 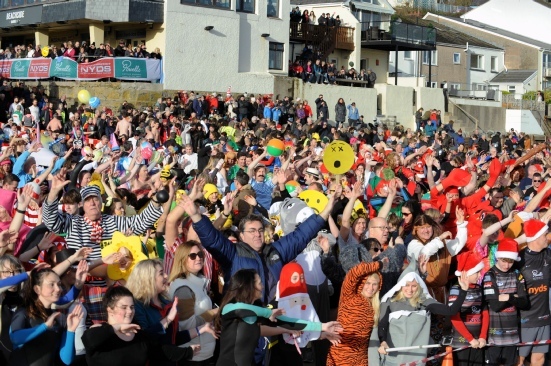 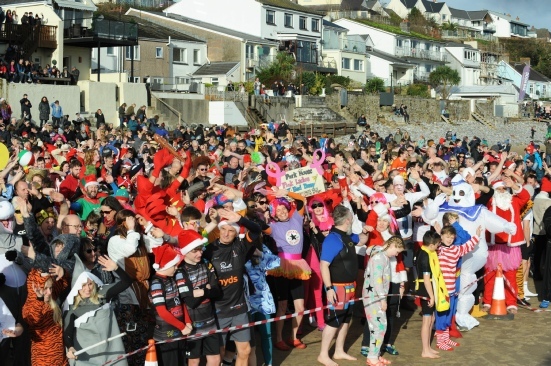 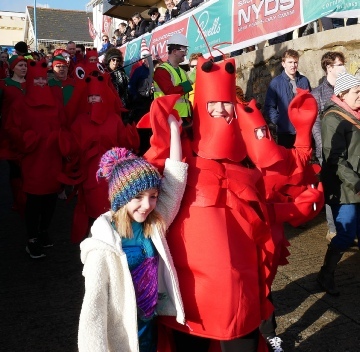 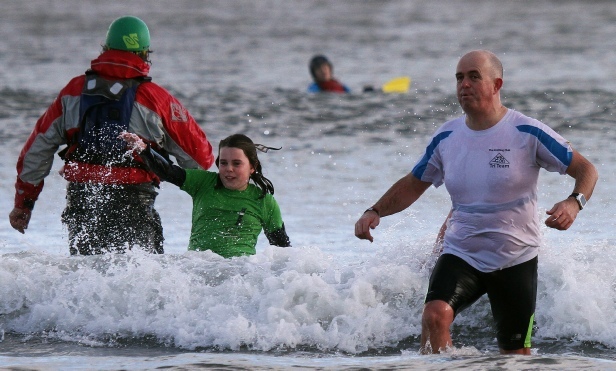 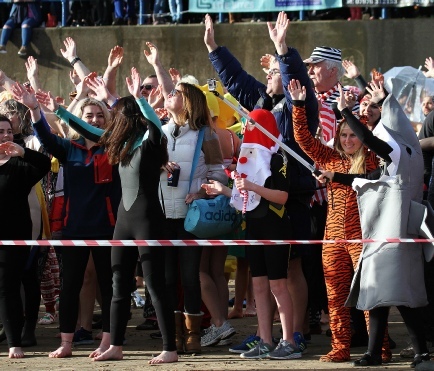 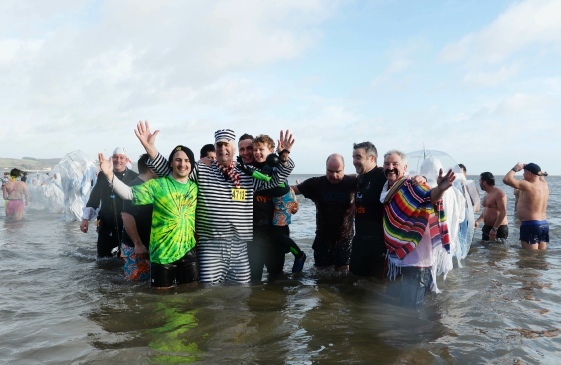 2028 swimmers and thousands of spectators braved the chilly breeze for the 34th annual Saundersfoot New Year’s Day Swim in Pembrokeshire. 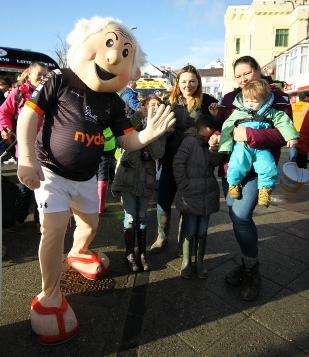 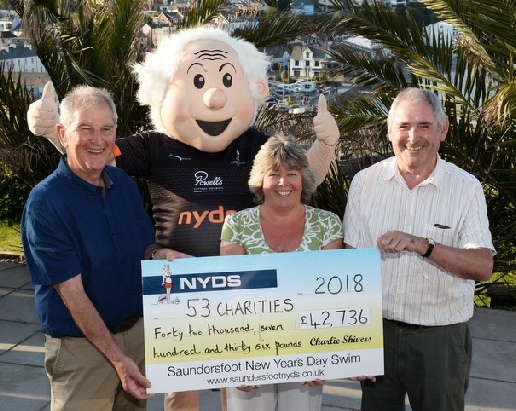 The charitable event just gets bigger and better – and as the gathered masses prepared for the big event they were entertained by the fictional long lost brother of NYDS mascot Charlie Shivers; Dai ‘The Shapes’ Shivers. 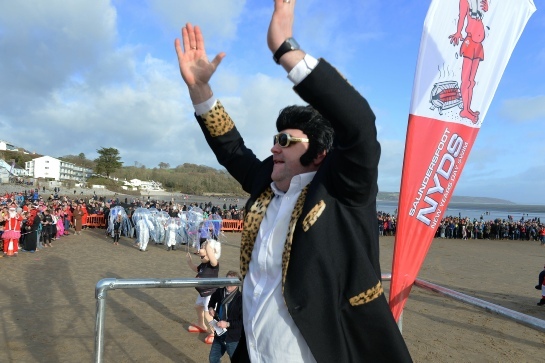 After 10 years wowing the audiences on cruise liners he pulled off his trademark ‘Night Fever’ moves and the crowd followed! 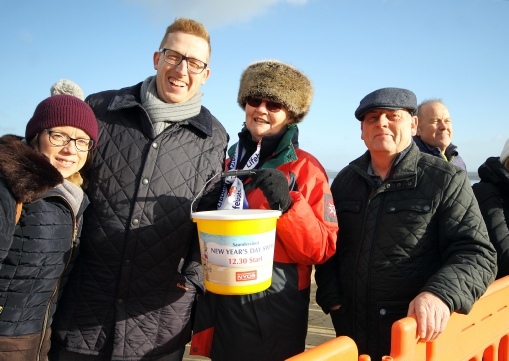 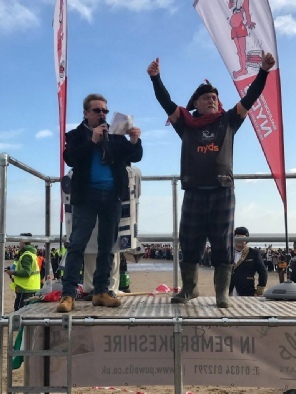 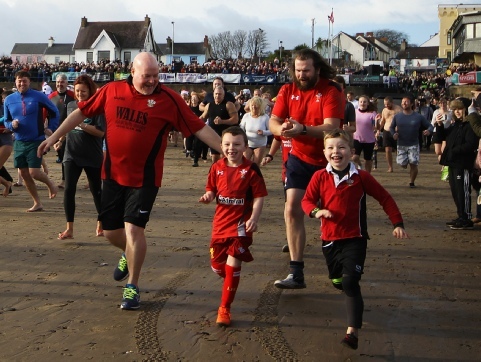 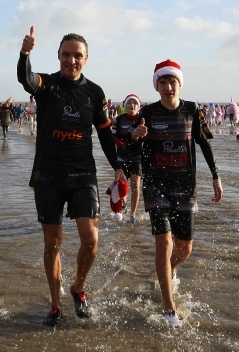 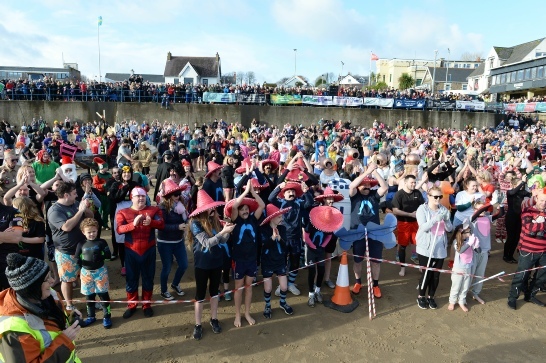 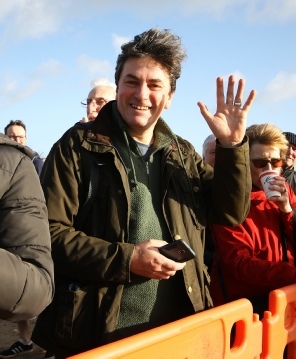 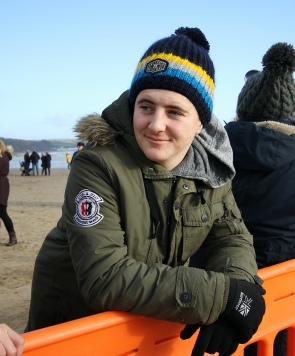 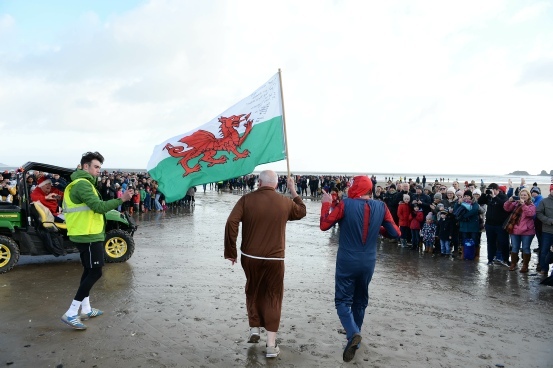 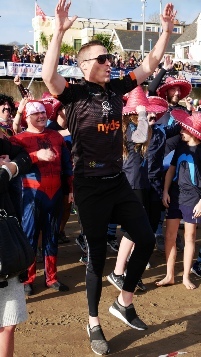 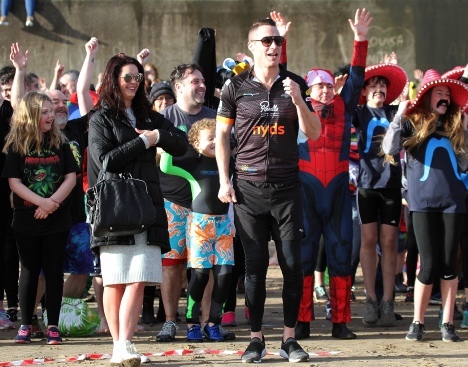 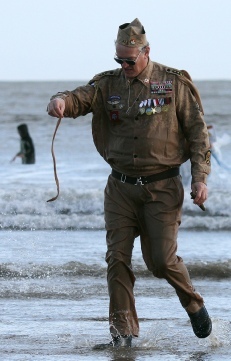 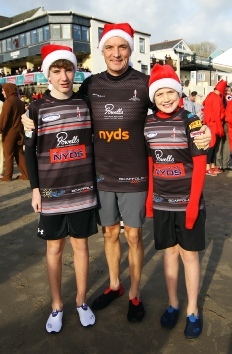 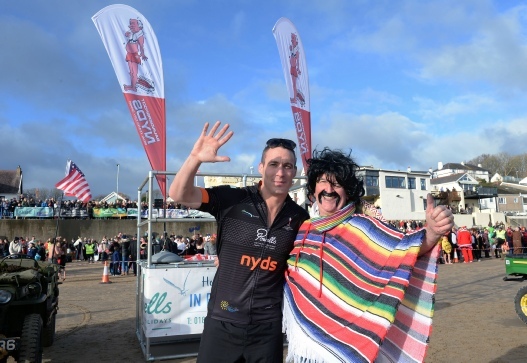 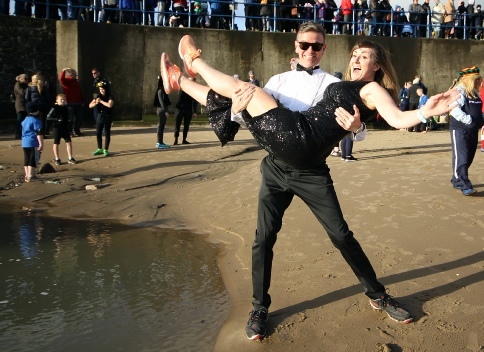 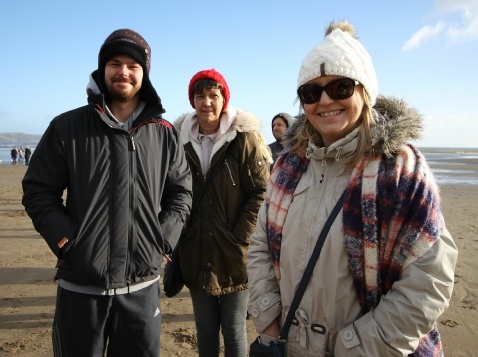 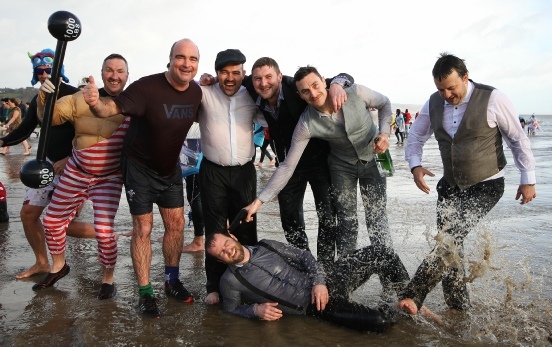 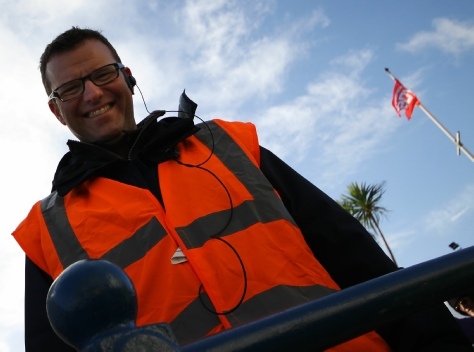 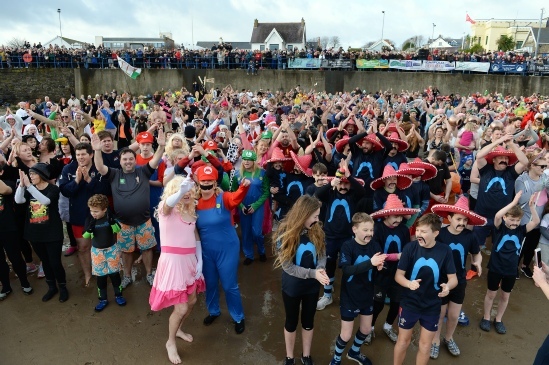 The swim countdown was initiated by former Glamorgan & England cricketer Simon Jones (who also joined in the event to claim his medal) and at 12.30pm the swimmers were sent down the sands by a firework launch courtesy of Westcoast Fireworks. 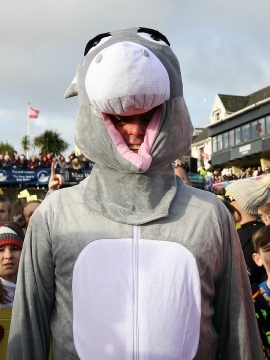 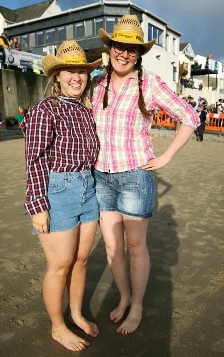 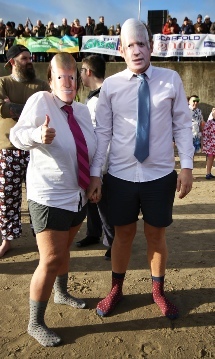 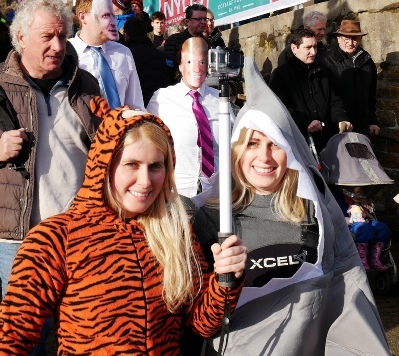 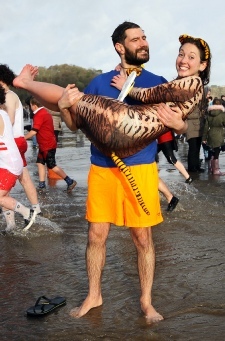 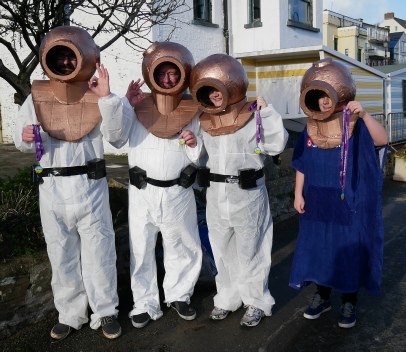 The swimmers did not disappoint on the fancy dress front. 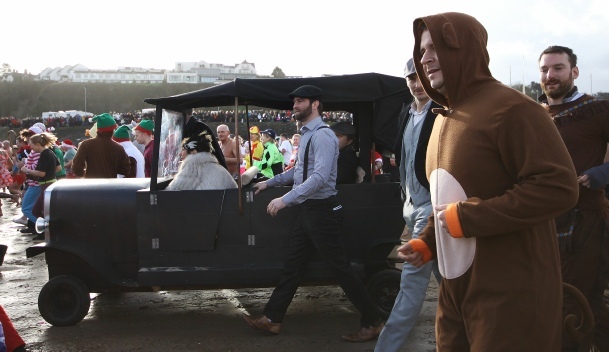 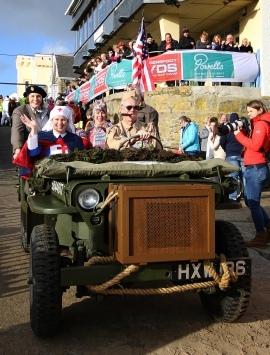 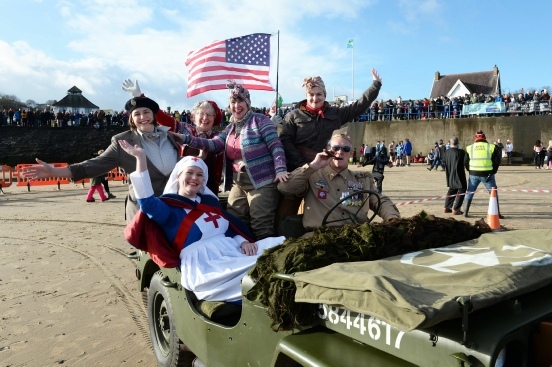 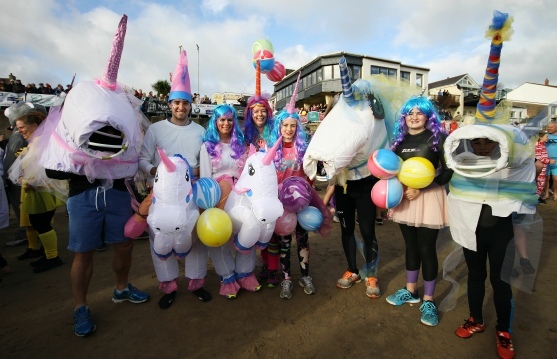 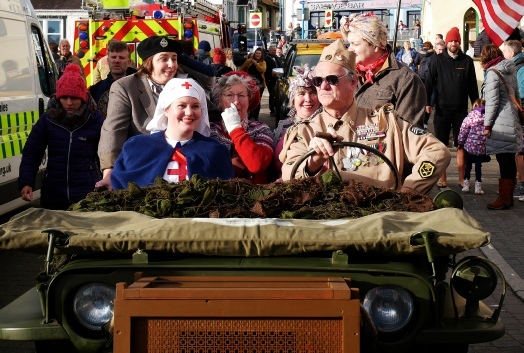 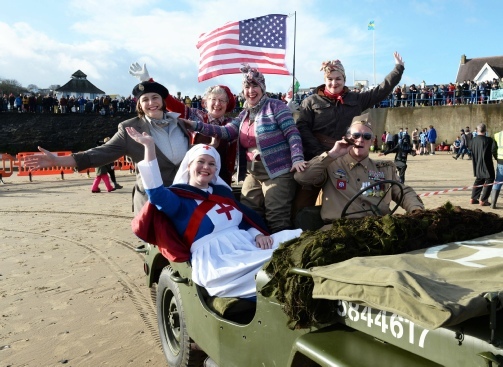 Highlights included a swarm of jellyfish, a gathering of Unicorns, a Mexican ‘Tash Mob’, Peaky Blinders and an old-style American Jeep complete with GIs and a General! 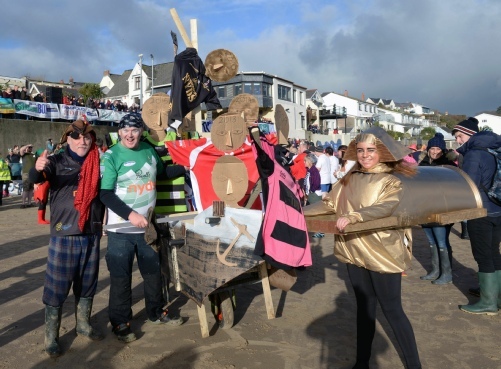 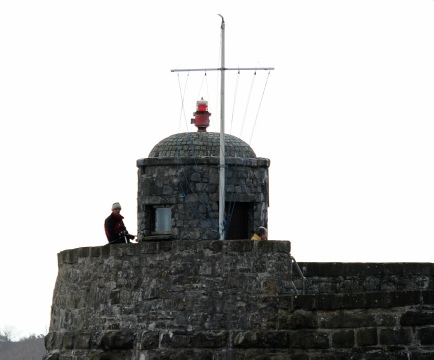 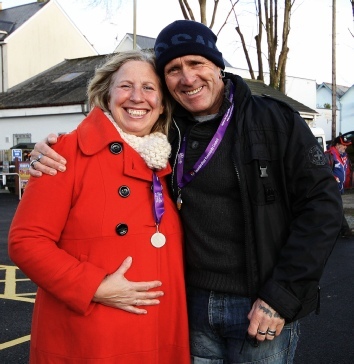 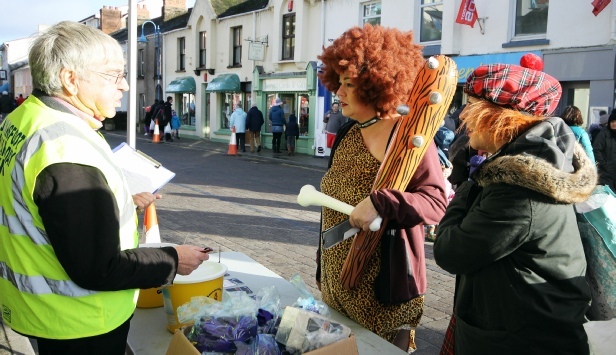 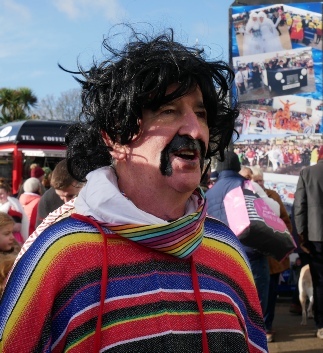 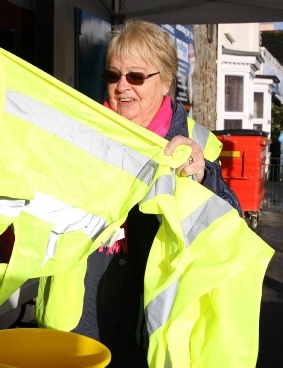 Saundersfoot Festivities Chairman Martyn Williams said, "The village and wider community has done us proud again. 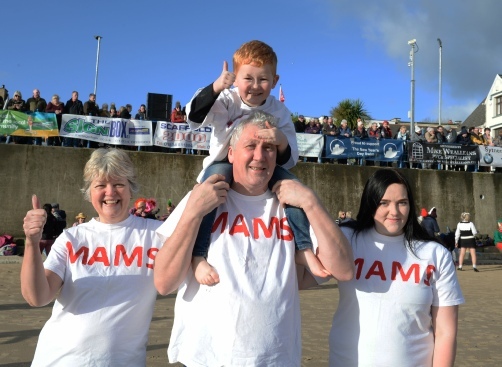 We could not have conceived 34 years ago we would be here now hosting such a major event. 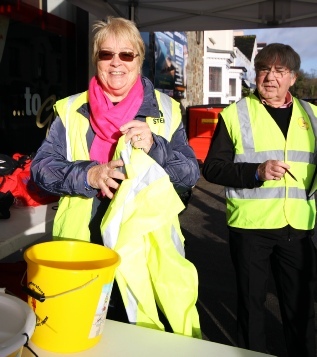 Our driving force as always is the huge number of fantastic causes that benefit. 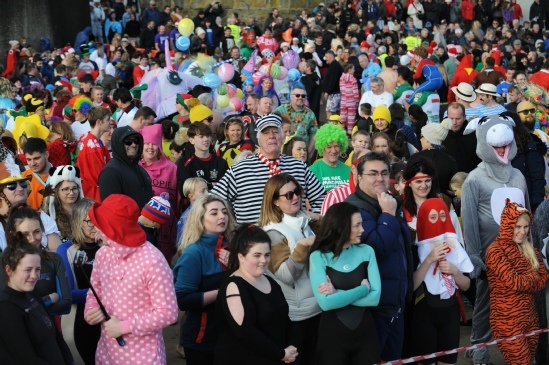 Thirty-three years on and this event is getting bigger and better with thousands of pounds being raised for charity. 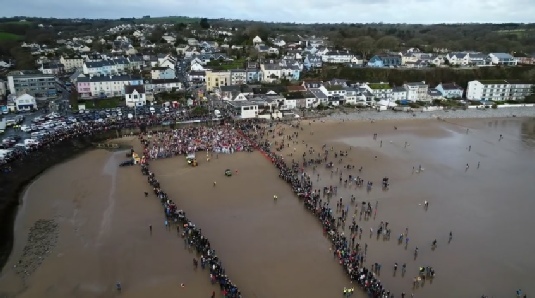 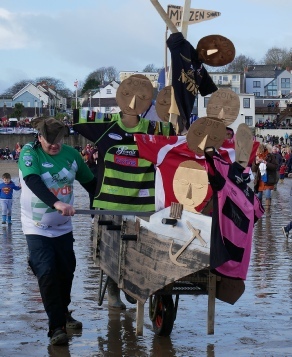 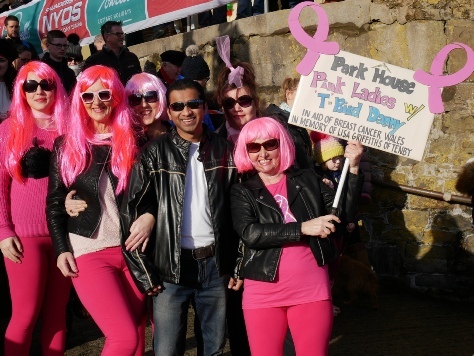 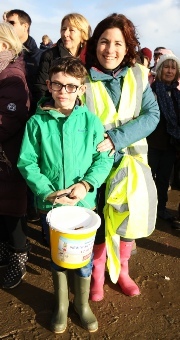 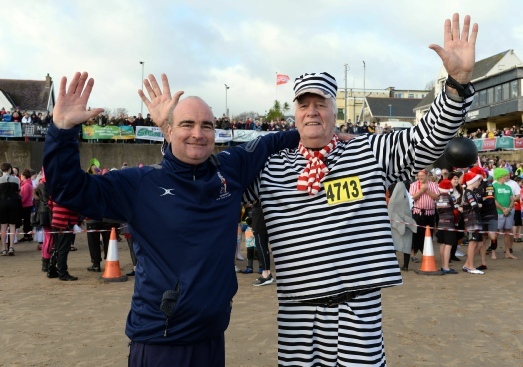 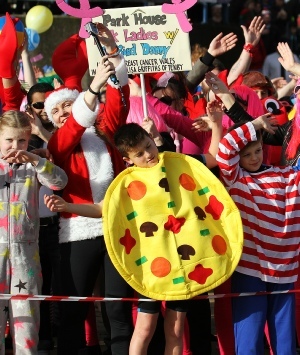 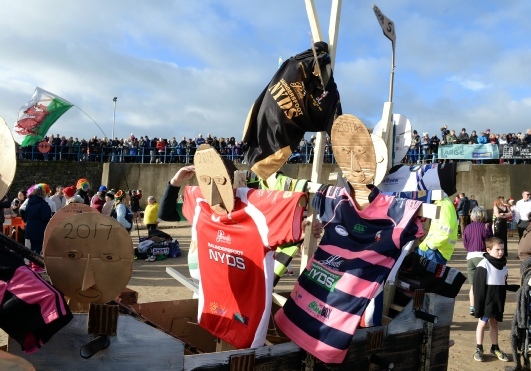 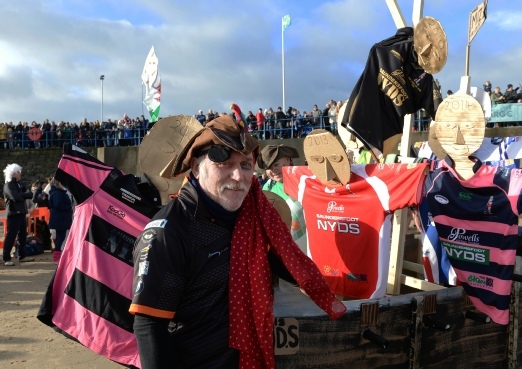 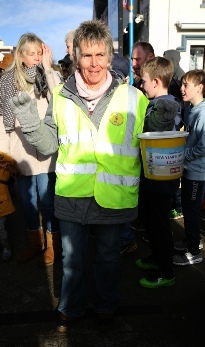 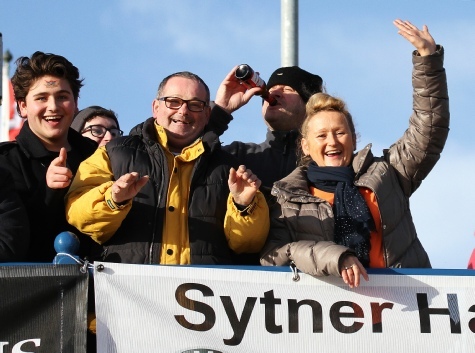 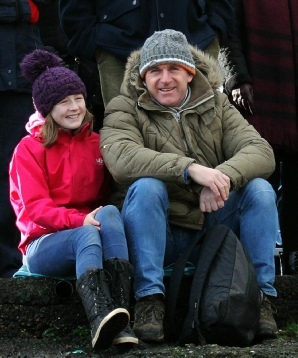 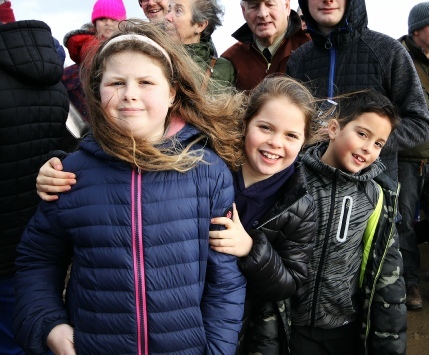 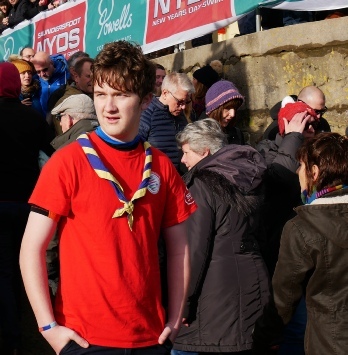 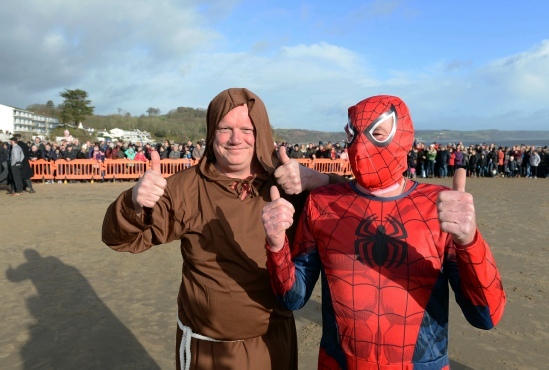 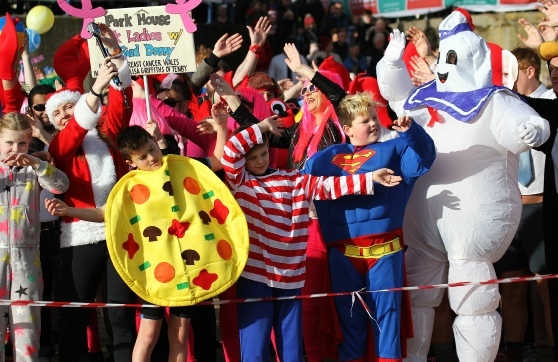 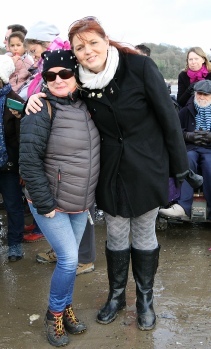 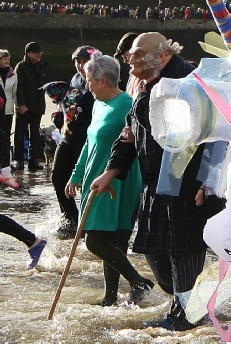 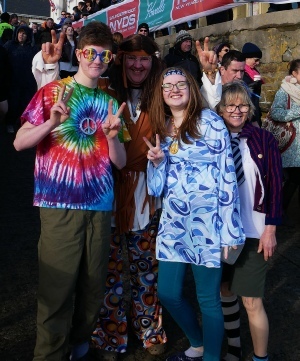 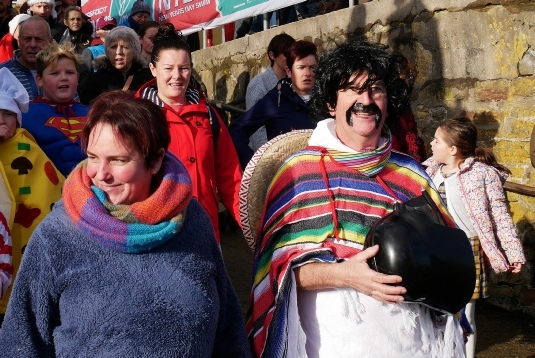 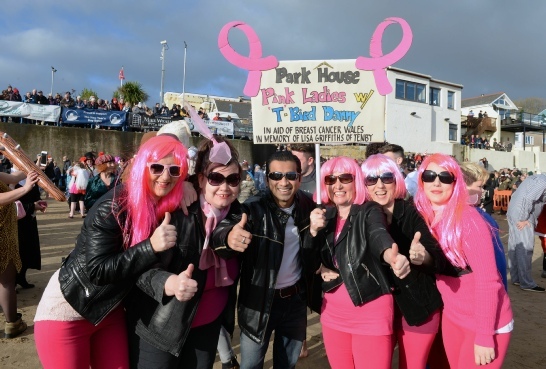 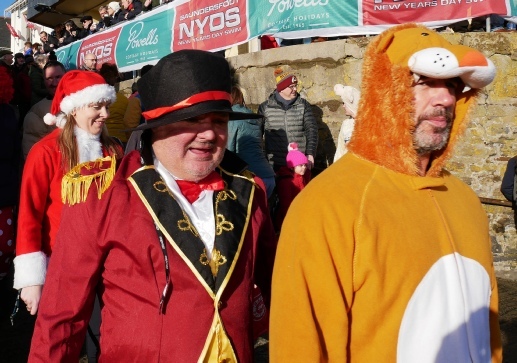 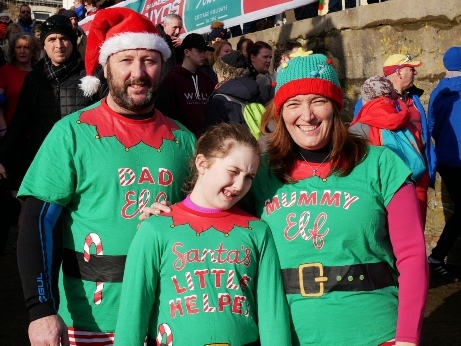 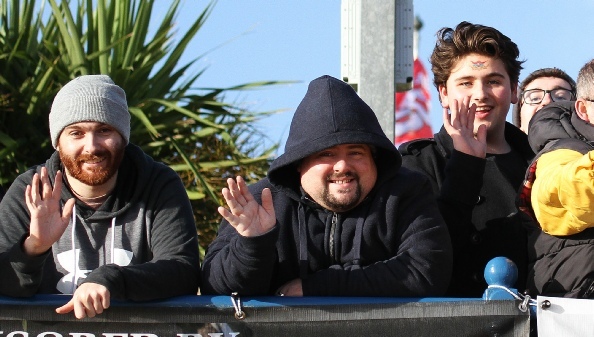 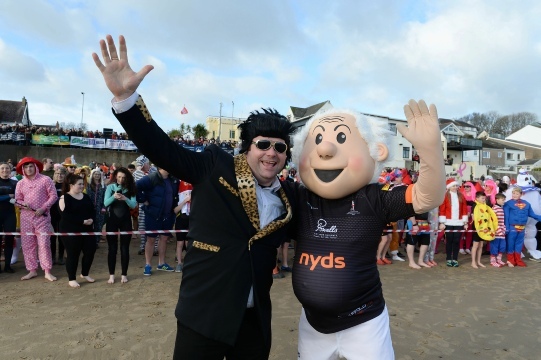 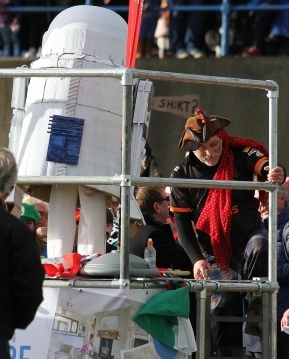 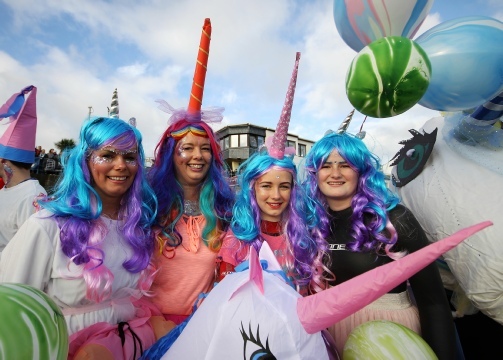 The people from Saundersfoot, the surrounding areas and even farther a field have come out in force to support this marvellous event despite the weather". 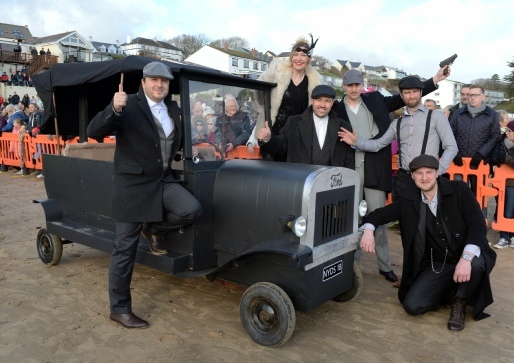 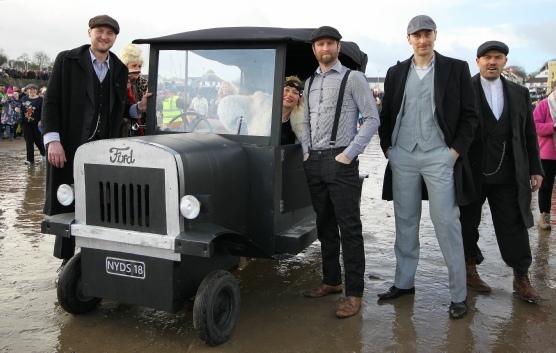 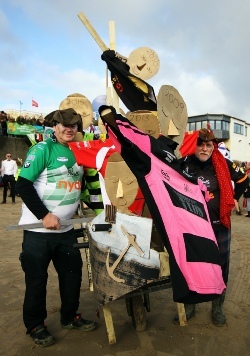 1st Place – The Jellyfish – Stepaside Coachworks. 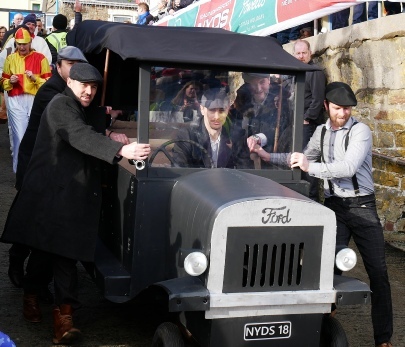 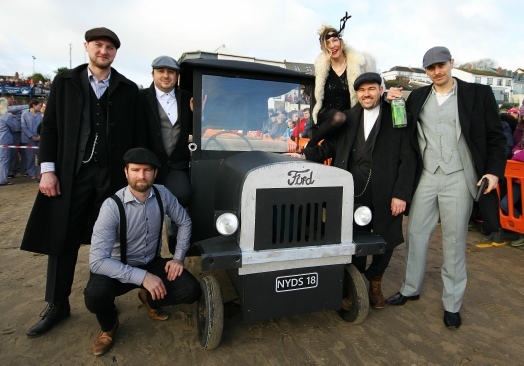 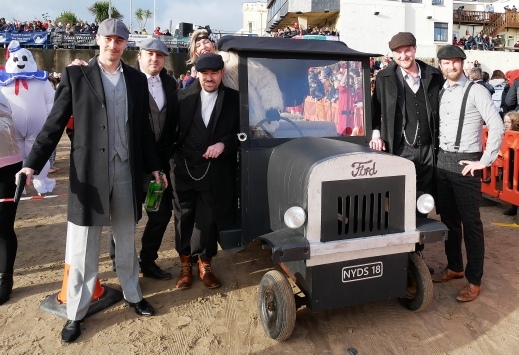 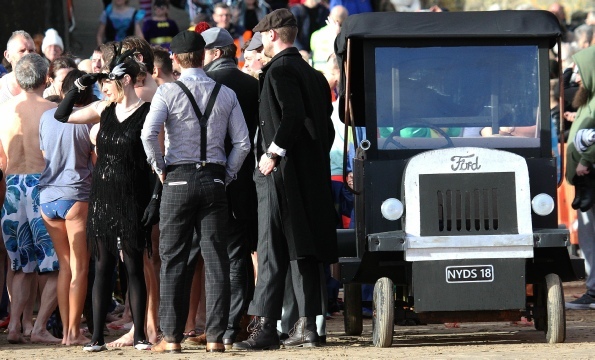 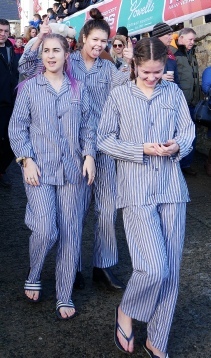 2nd Place – Peaky Blinders – Malin House Hotel. 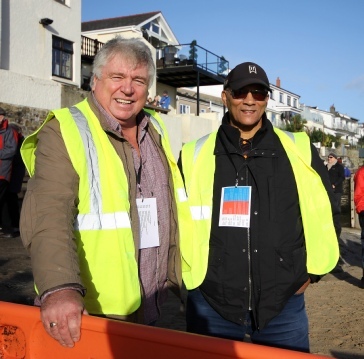 Contact: Steve Williams, Chairman of the Organising Committee. 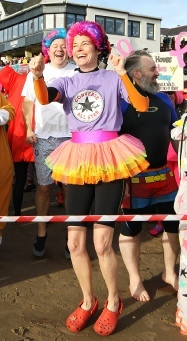 Tel: 07903 317550 / 01834 813018. 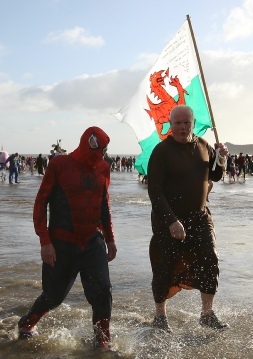 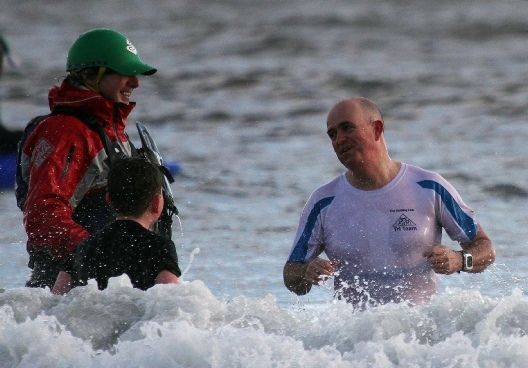 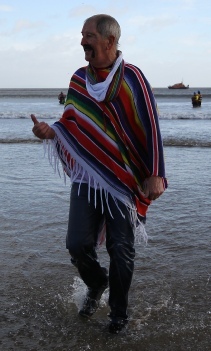 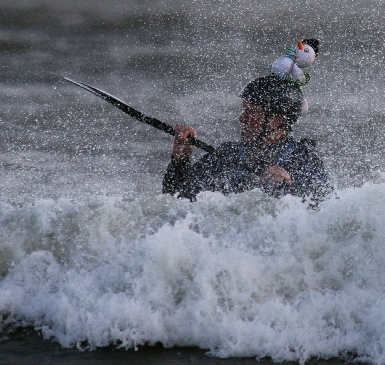 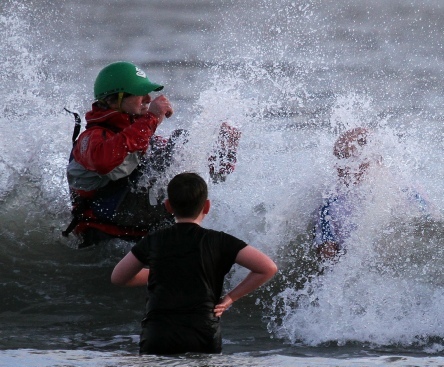 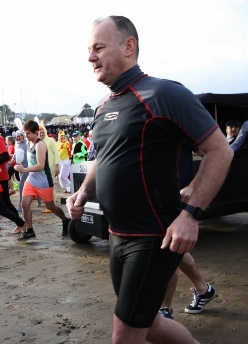 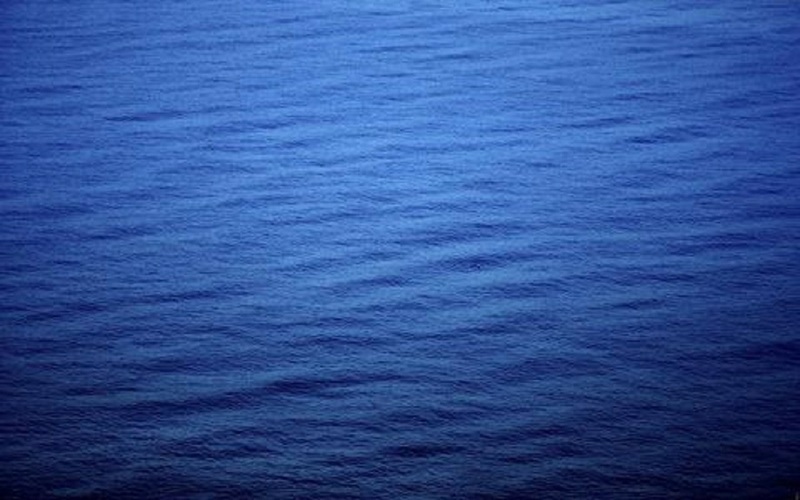 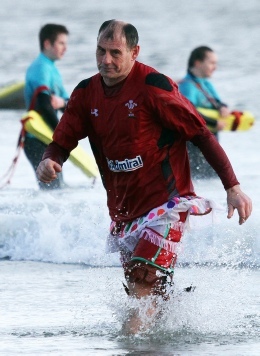 Photographs of the swim can be obtained from Gareth Davies Photography, Tel: 07836 334436. 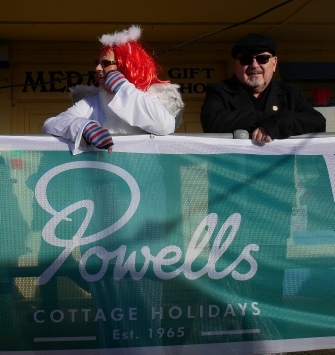 Powells Cottage Holidays, Harbour Wealth, Scaffold 2000, Sunnyvale Holiday Park, Broughton Leisure Ltd, Tees R Us, Tojaz of Saundersfoot, Princes Gate Spring Water, Elston Construction, Folly Farm, Taf Valley Coaches, Sue’s Pantry, Saundersfoot Pleasure Boats, 1 Formula Fitness, Tenby Glass, Sytner BMW, Lewis, Lewis & Co Ltd, Mike Wealleans PVCu Specialist, Neil Finlay Cars, Pembrokeshire Tyres & MOT and Saundersfoot Community Council.